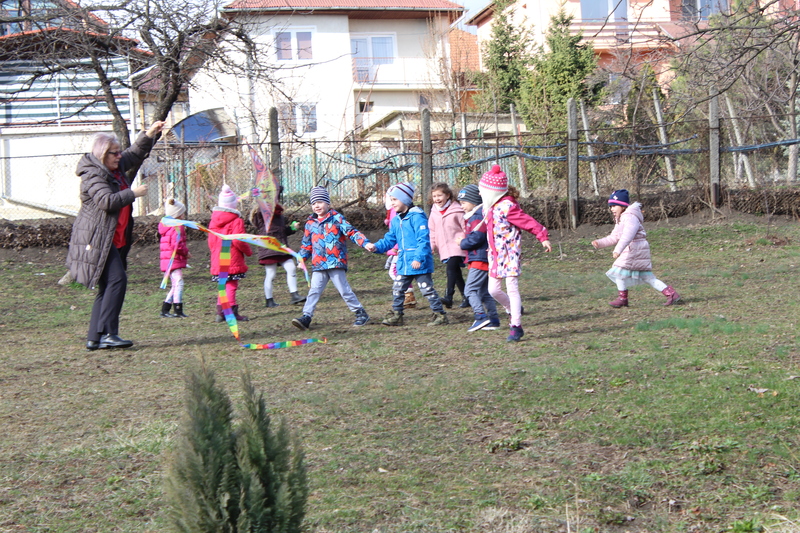 Game description: Game “Smart smurf and flying kites” can be played by 2-3 players. 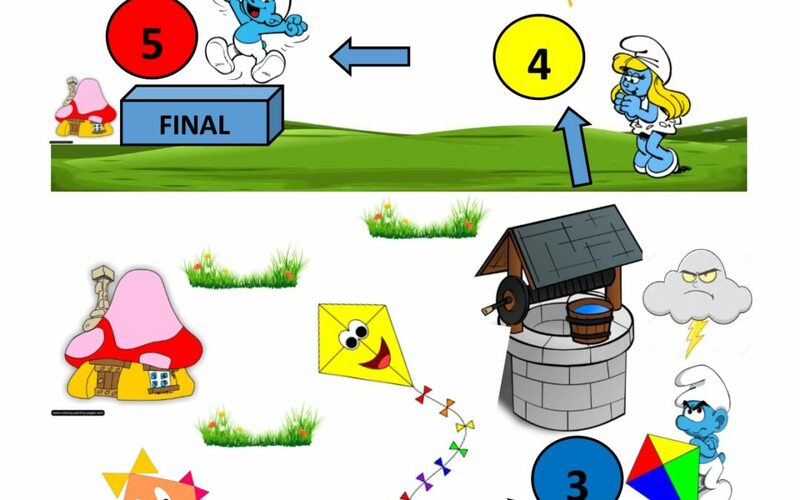 The game is to help Smart smurf reach kite flying. 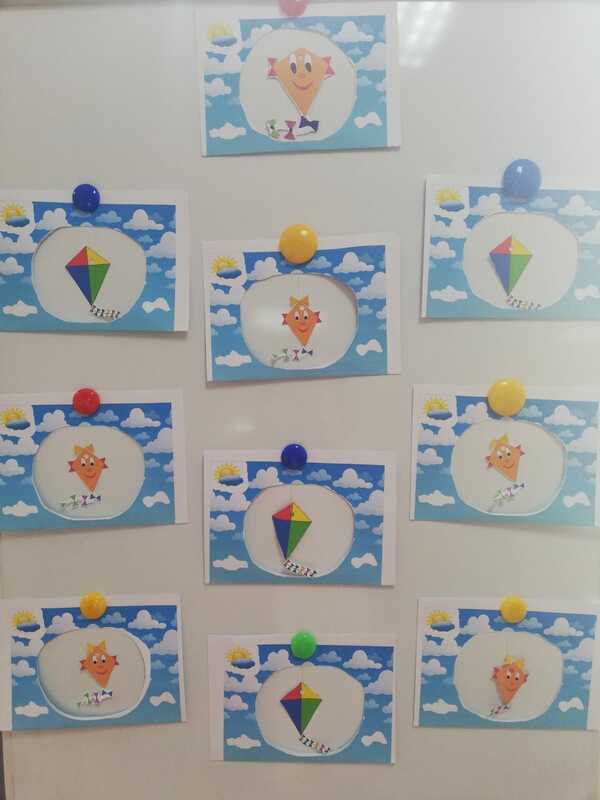 To do this, players must navigate through the five points of the game (1-5) and observe significant endorsement for each color. 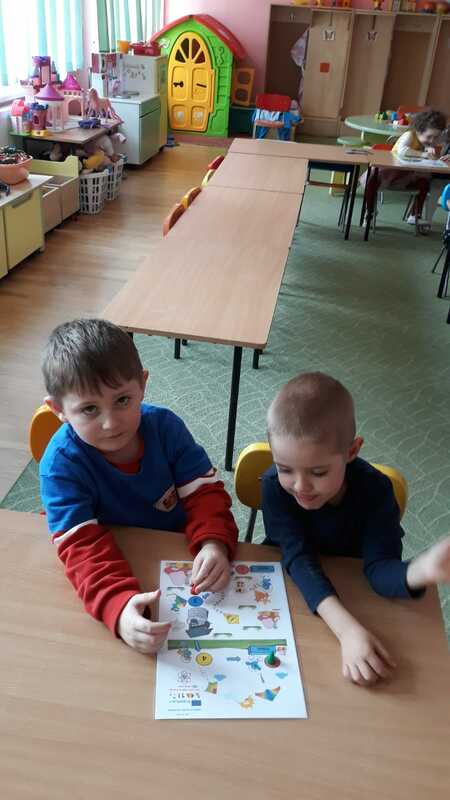 Rules of the game: Each player takes a pawn. 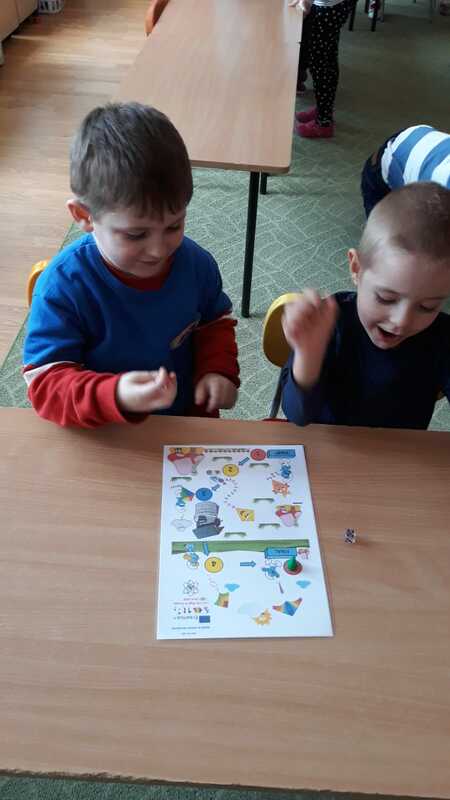 To determine the route each player starts throwing dice. 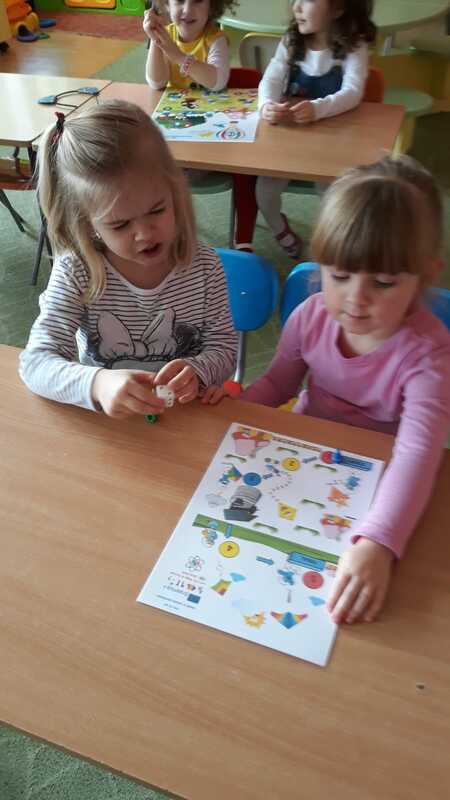 Child find the largest number on the dice is the first to start browsing path. 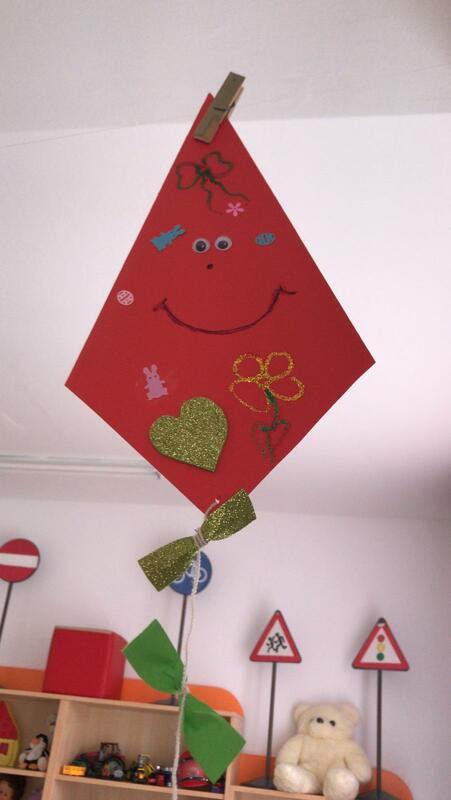 1- red- to a box! 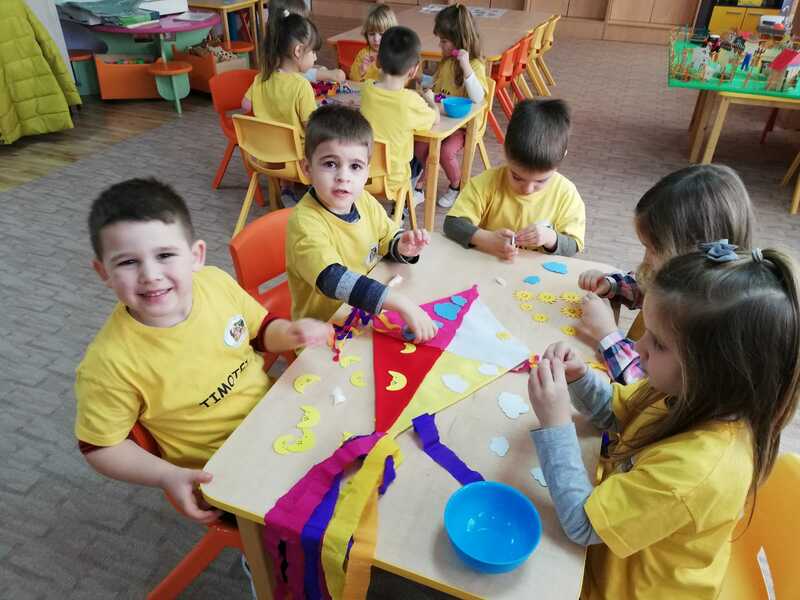 2 yellow go back to START! 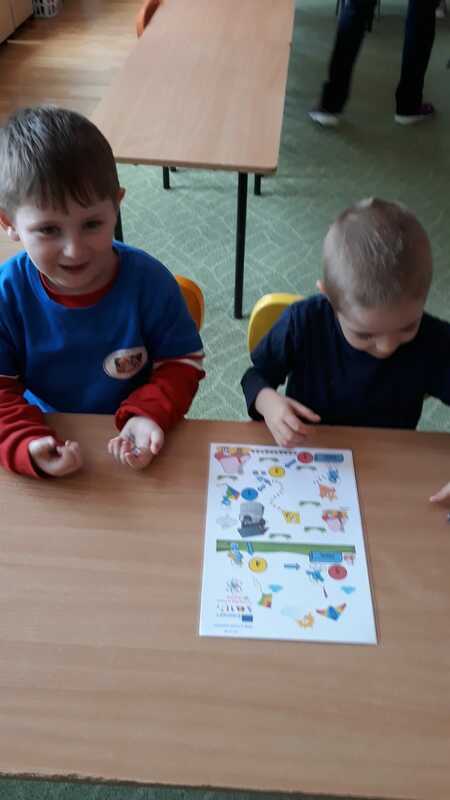 3 blue’re lucky! 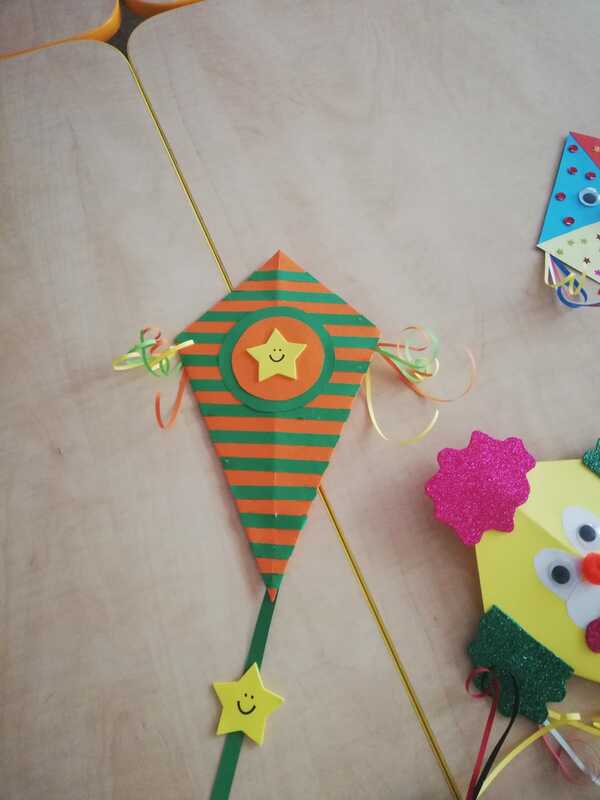 – You went straight to kite flying, that you finish the game! 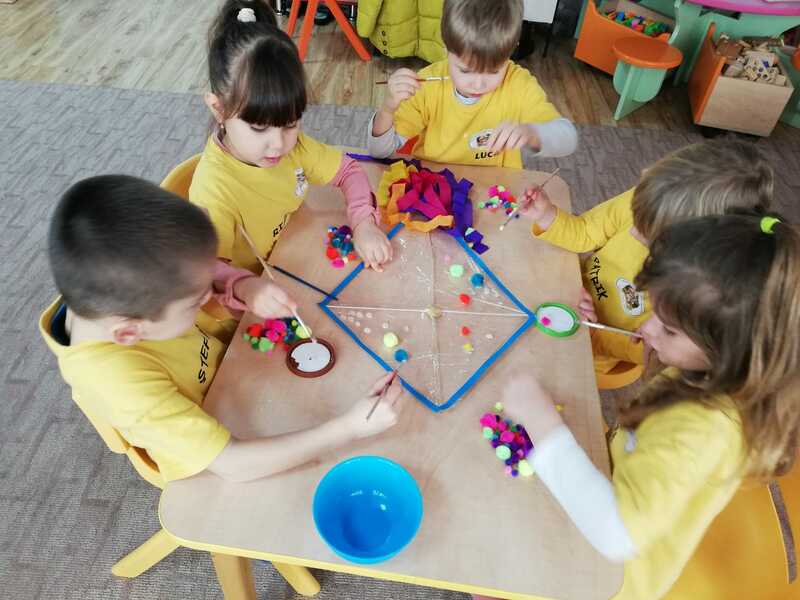 4- yellow go back to START! 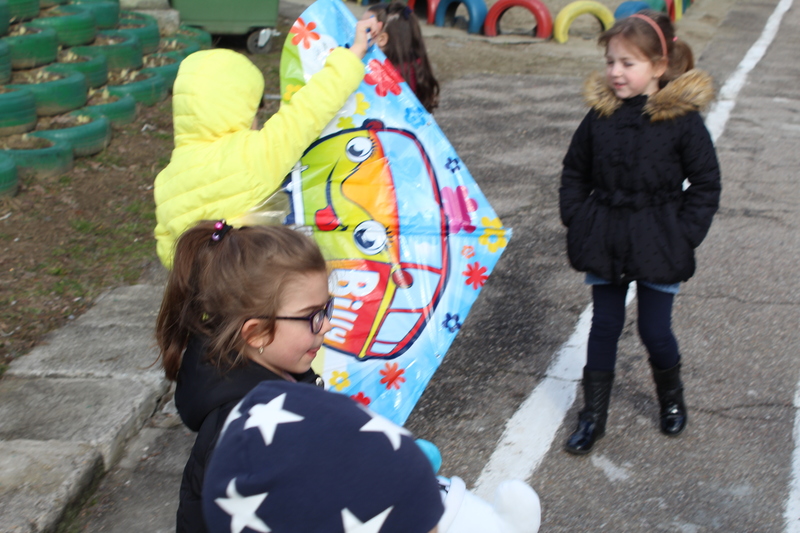 The child who gets first at the kite is the winner and the game continues until set the places II and III. 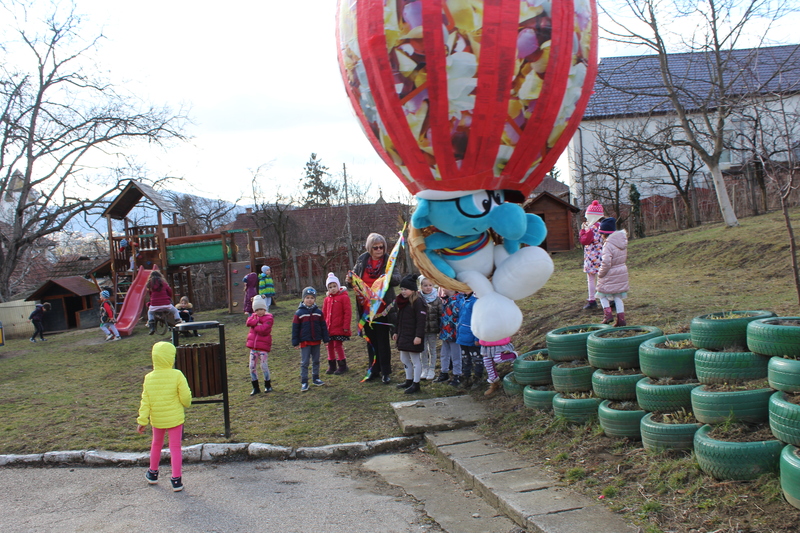 ***Because our mascot project is Smart smurf, very popular for preschool children, mention that we used these wonderful creatures only for educational purposes without neglecting copyright, which is why we present below the following data taken from https: //ro.wikipedia. 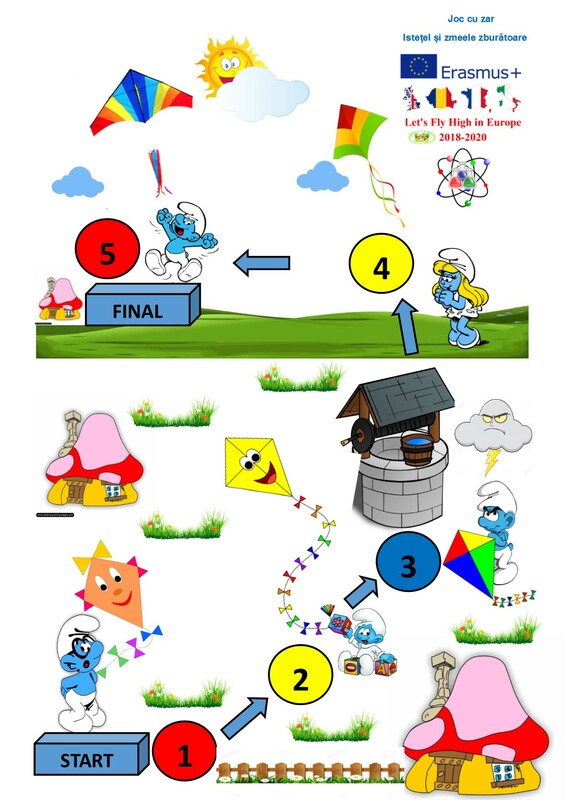 org / wiki /% 8% 98trumfii: ”Smurfs is the generic name of creatures fictitious blue, which are the main characters of a comic title namesake created by Belgian cartoonist Pierre Culliford, aka Peyo, who was born in Brussels on June 25, 1928. 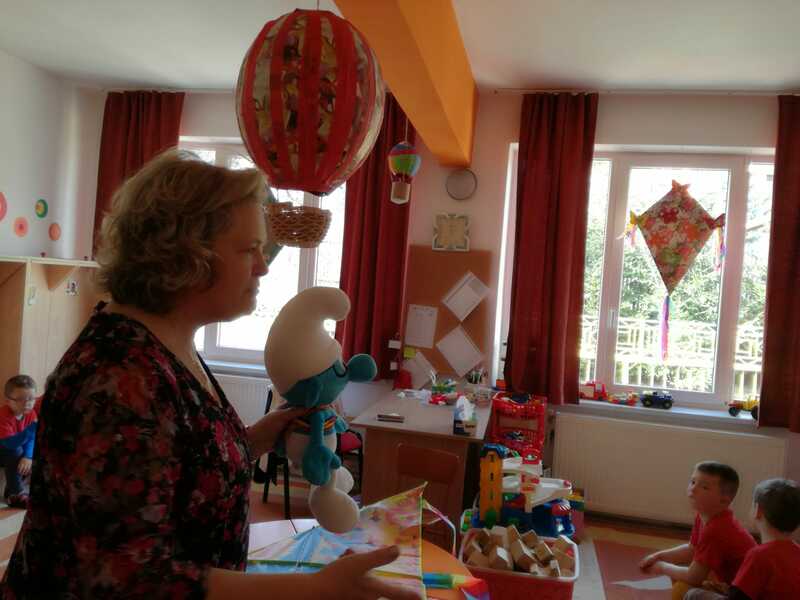 In 1981, a series of Smurfs was created by Hanna-Barbera. 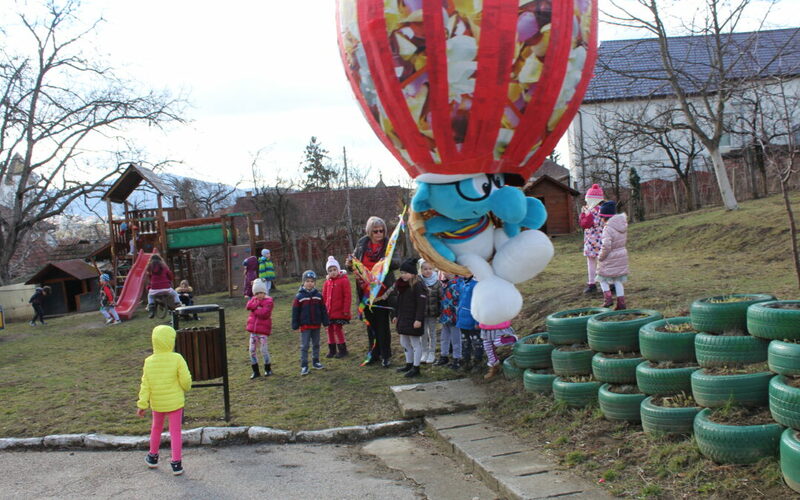 In August 26, 2011 he premiered in movie theaters with live-action Smurfs. 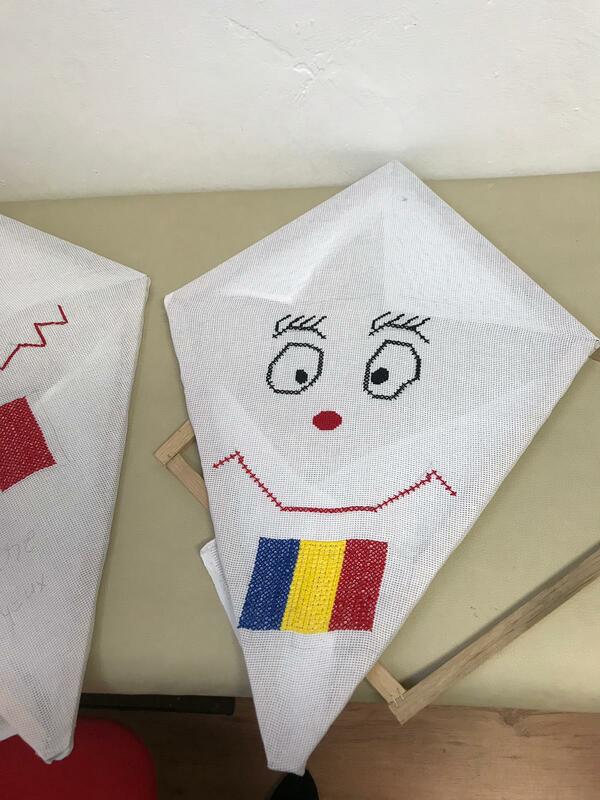 Ștrumfi name is Romanian version of the original French title Les Schtroumpfs. 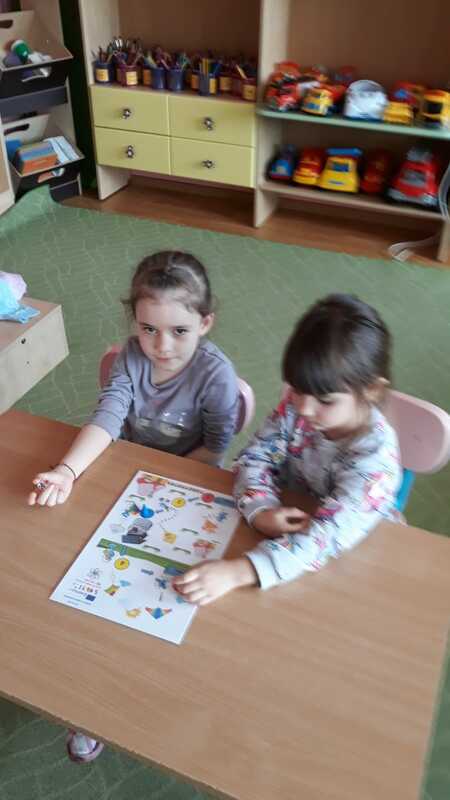 The English are known as Smurfs. 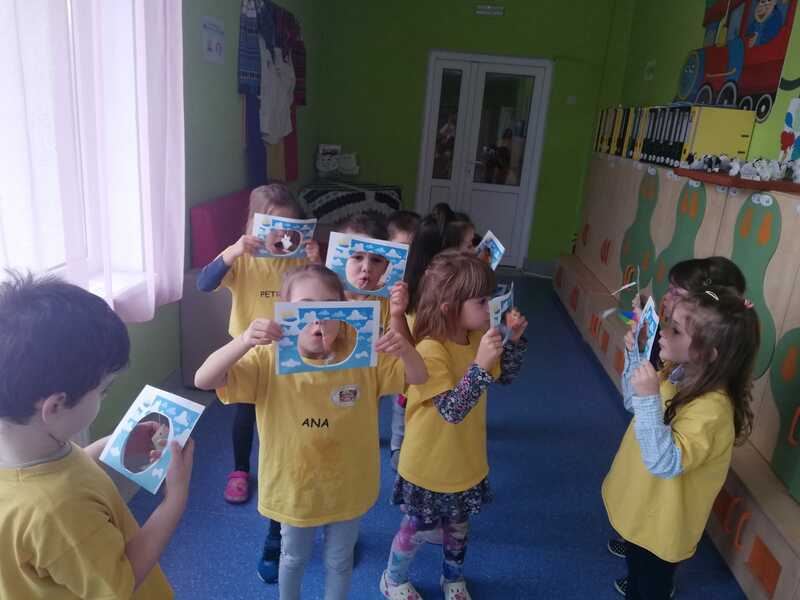 Become celebrities in the world of children, elves receive baptism different cultures: the Smurfs in English at Schlumpfs, Smolfs, Puff, Sumafus, Torpikeks, pitufos or intro- Shin-Ling in Chinese. 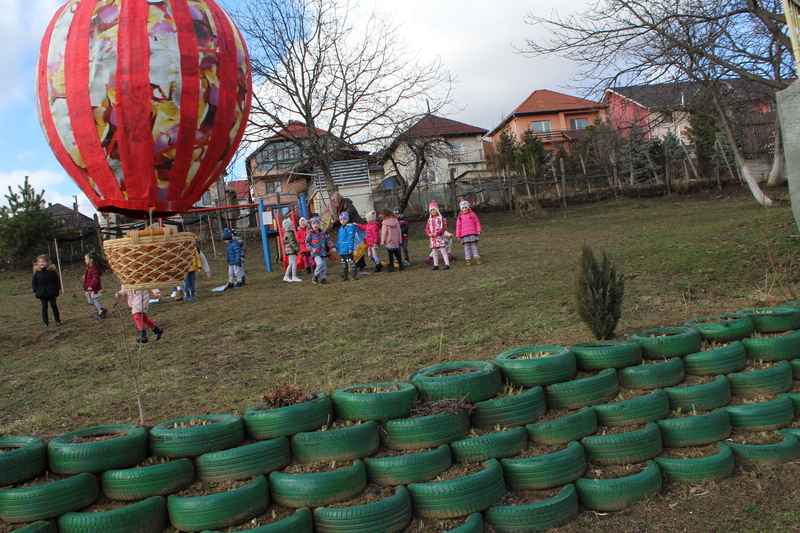 • to enrich and activate vocabulary with words as: basket, burner, tire. 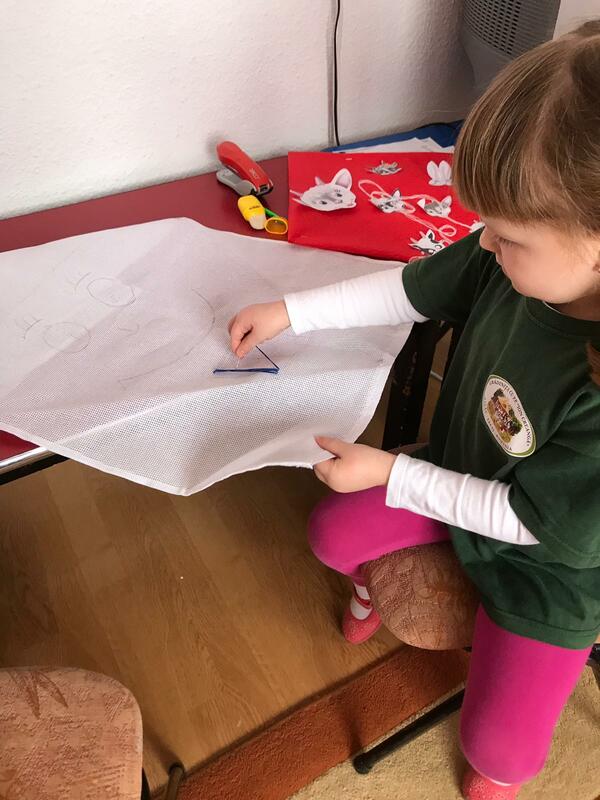 The present activity starts using the two devices, and each device will be systematic observed by comparison. 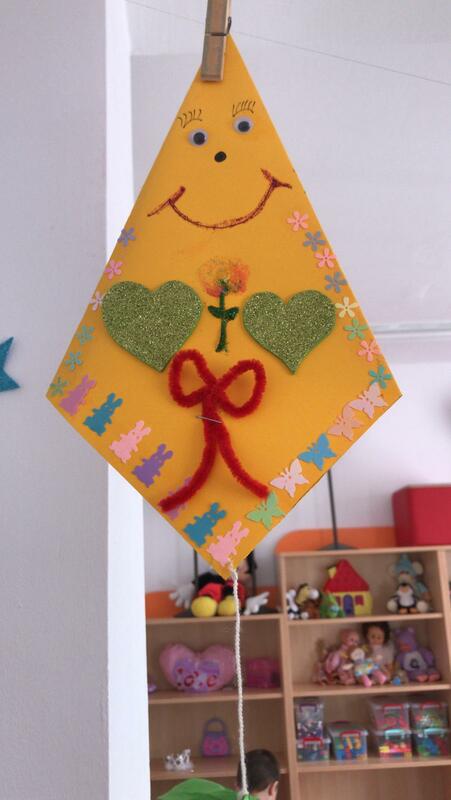 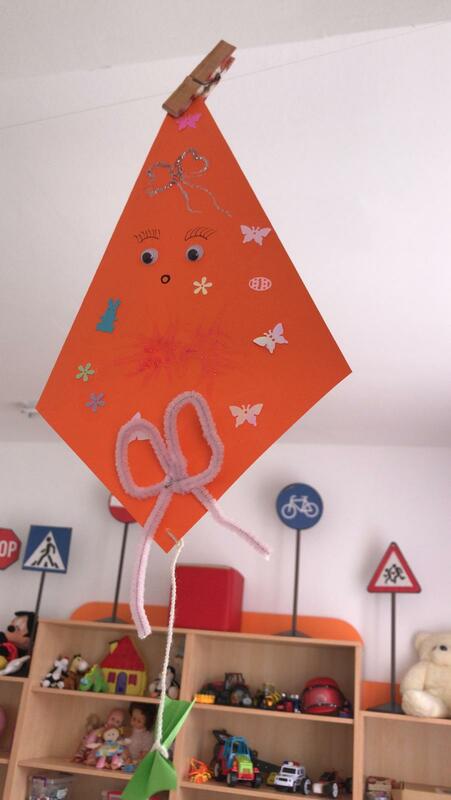 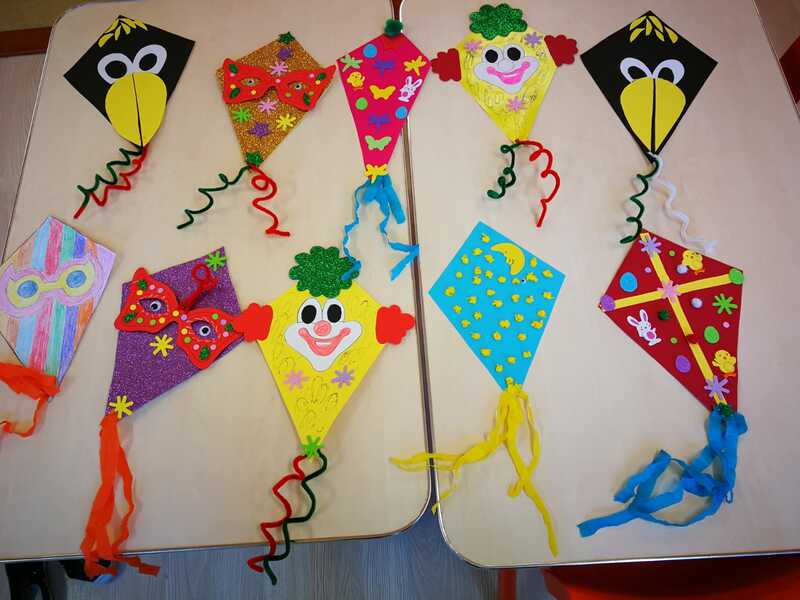 In the courtyard of kindergarten children will ascend kites. 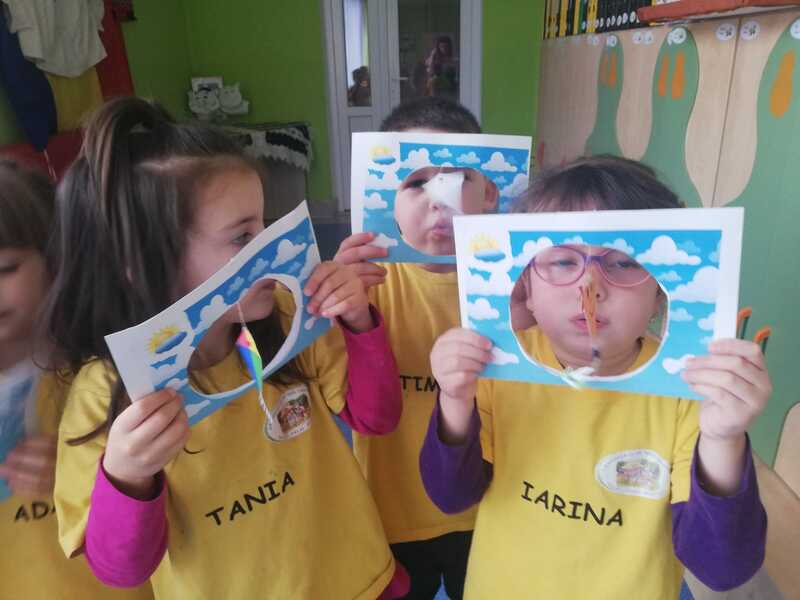 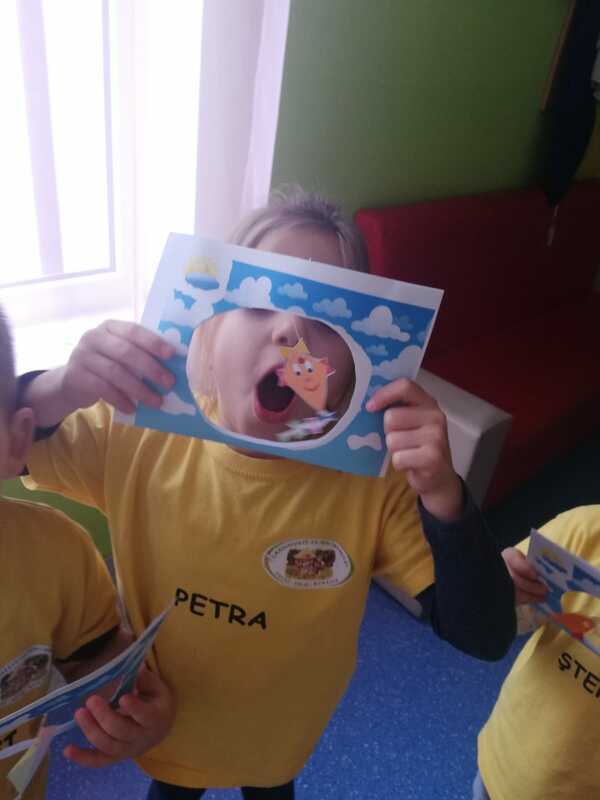 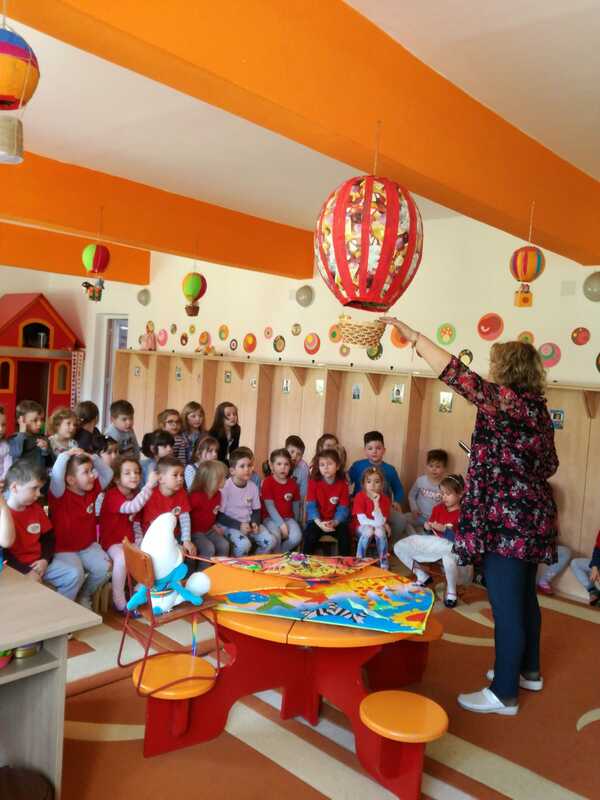 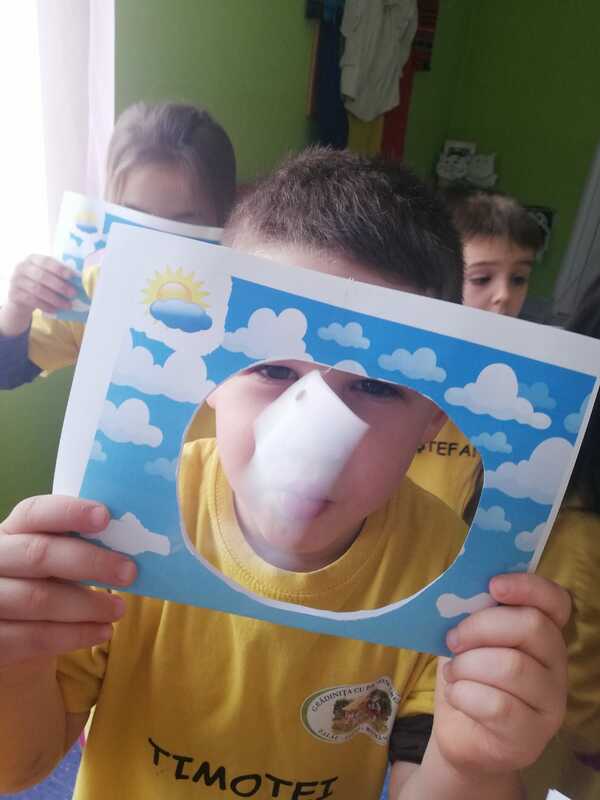 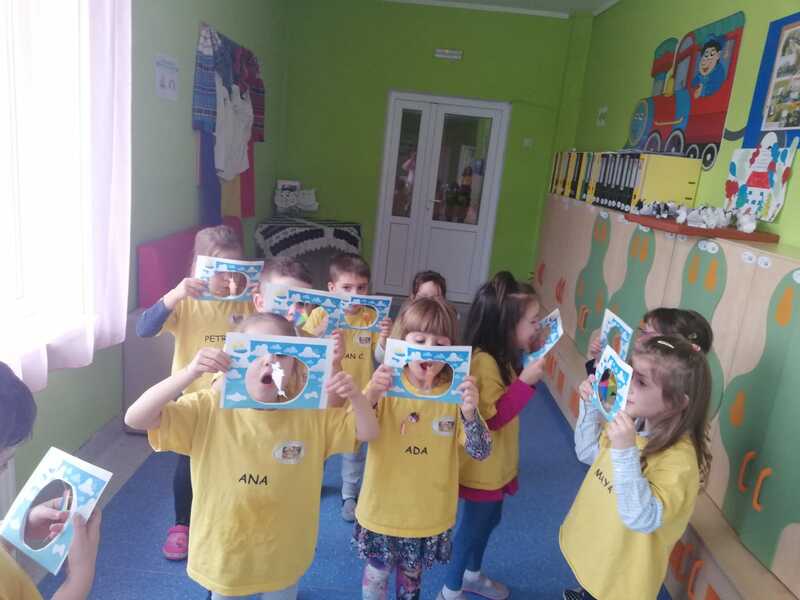 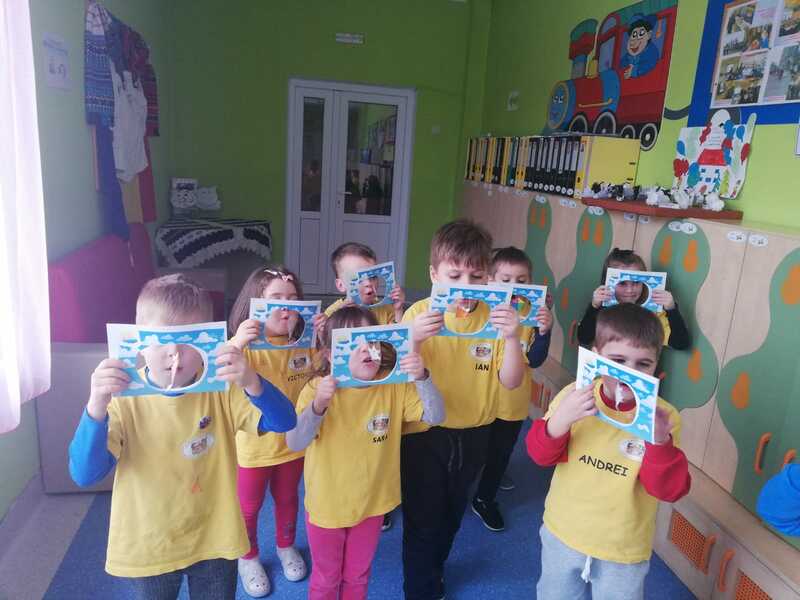 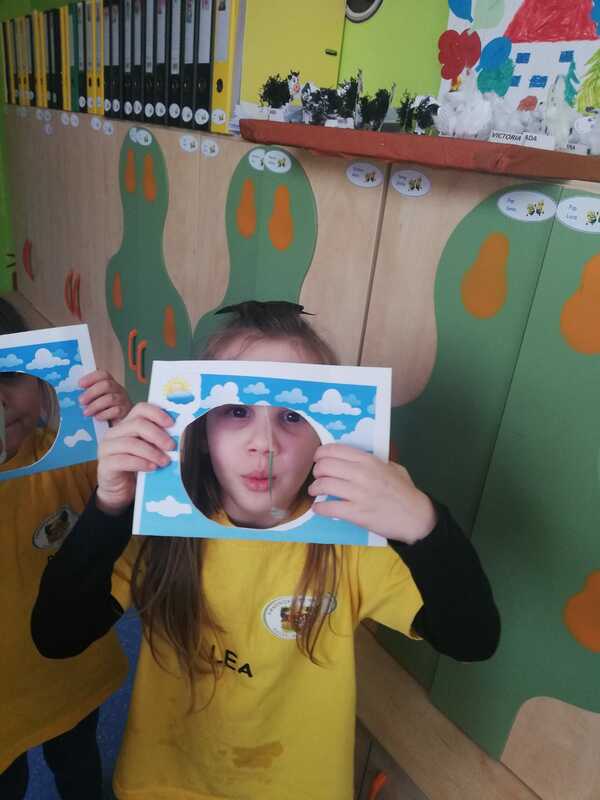 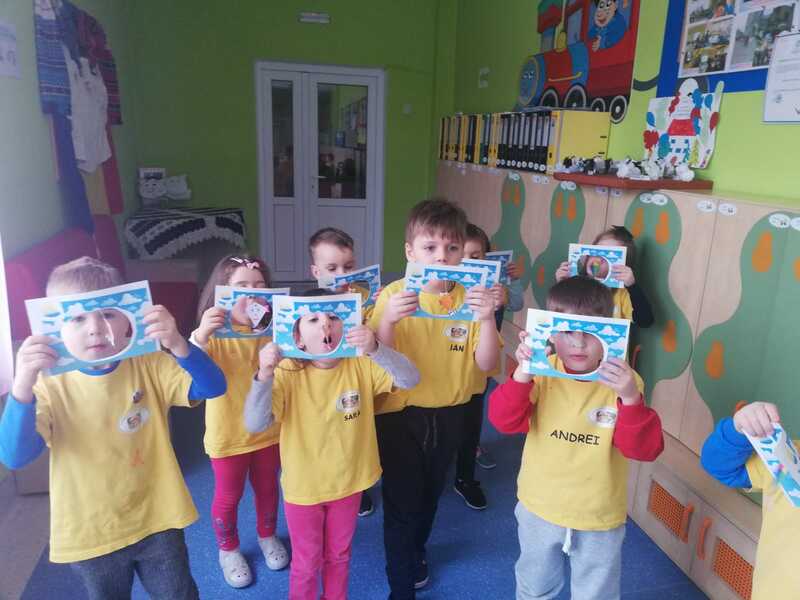 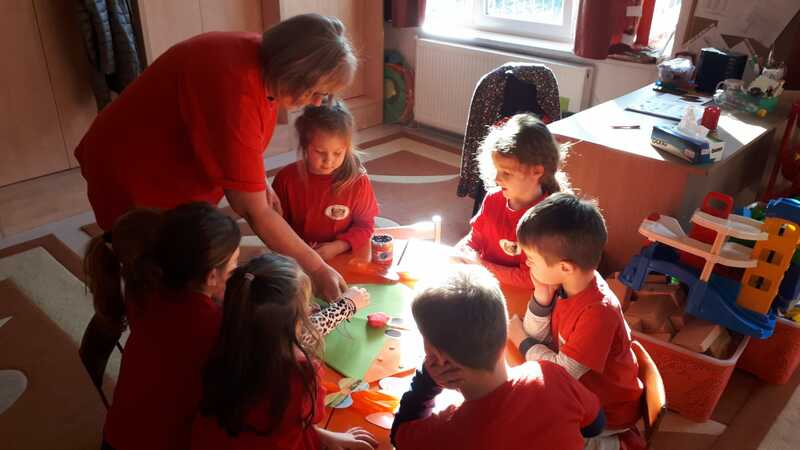 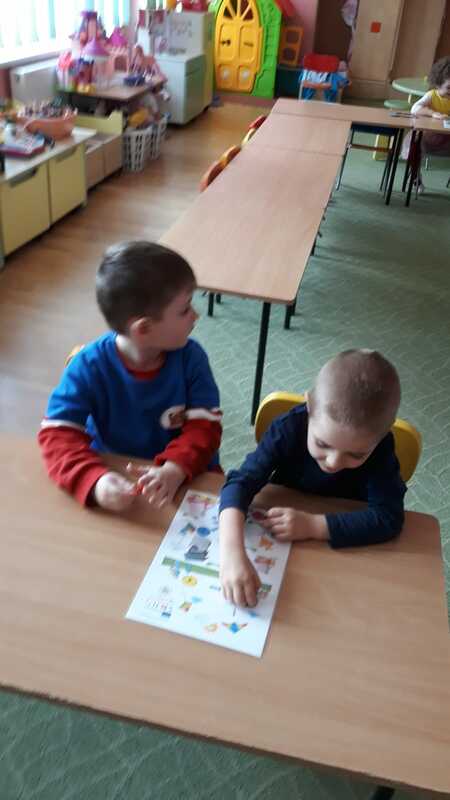 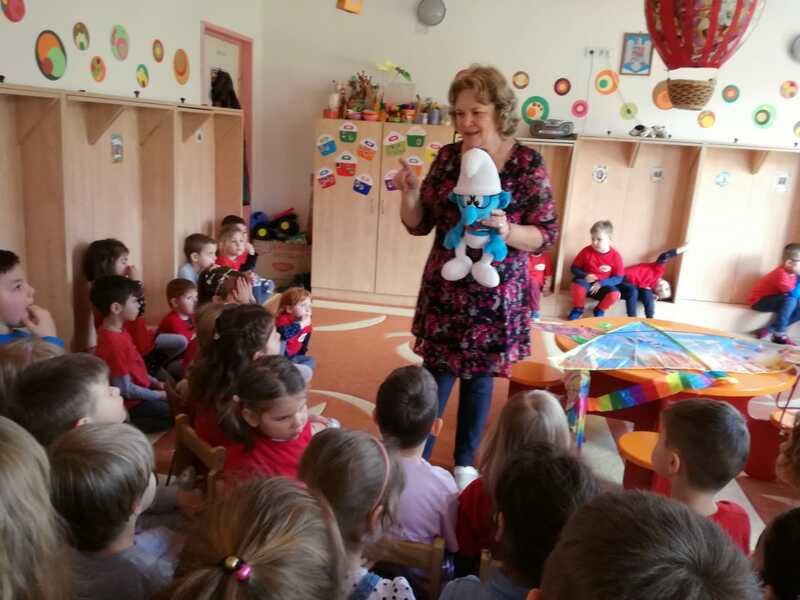 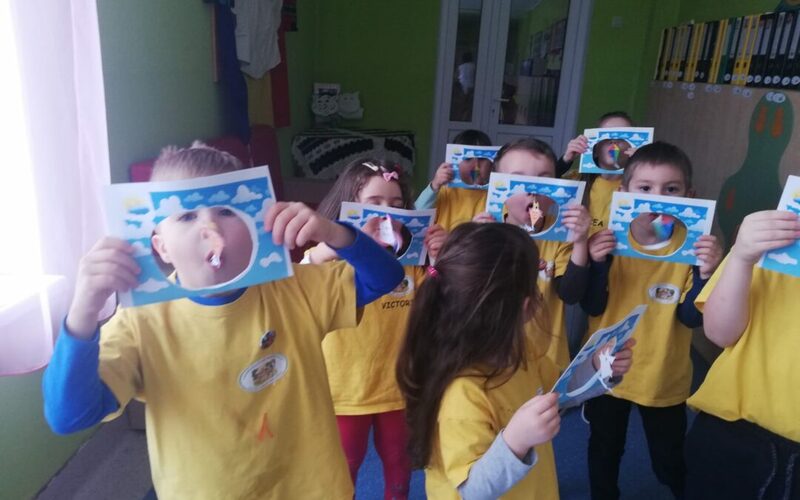 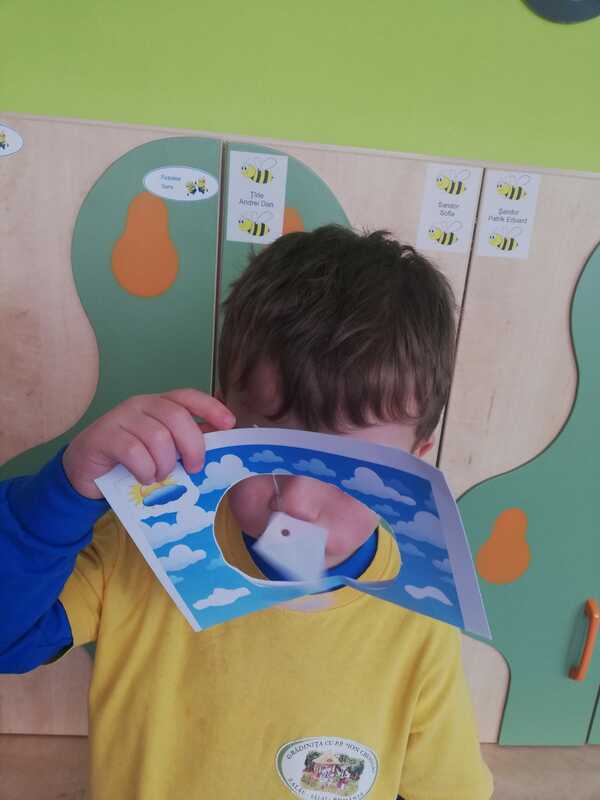 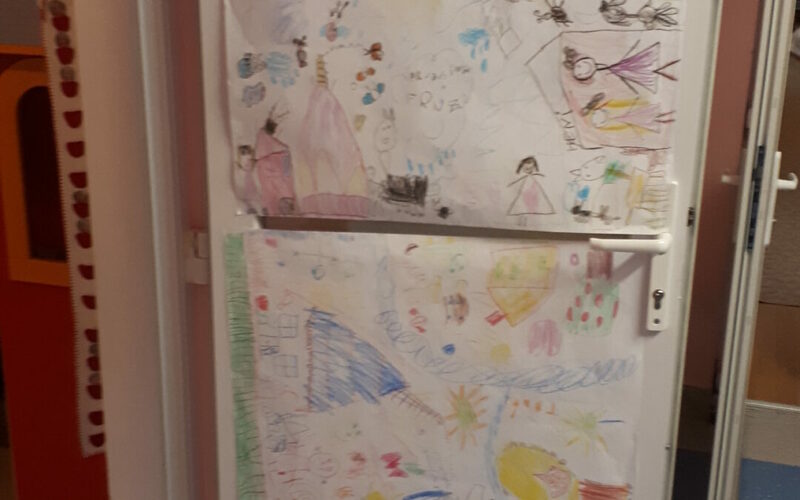 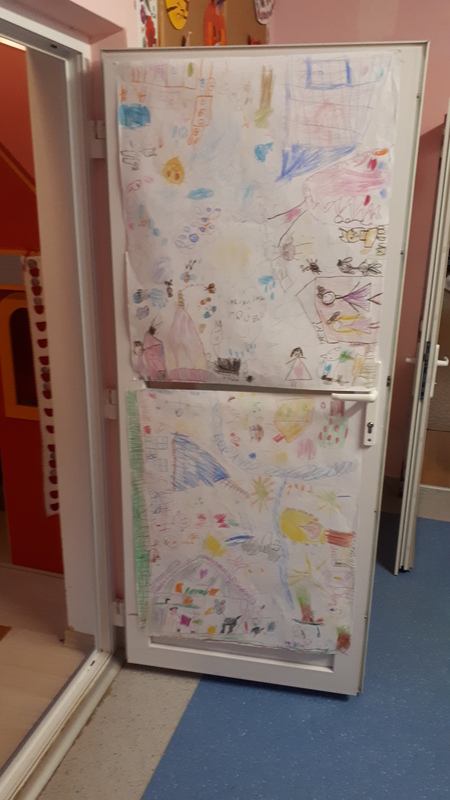 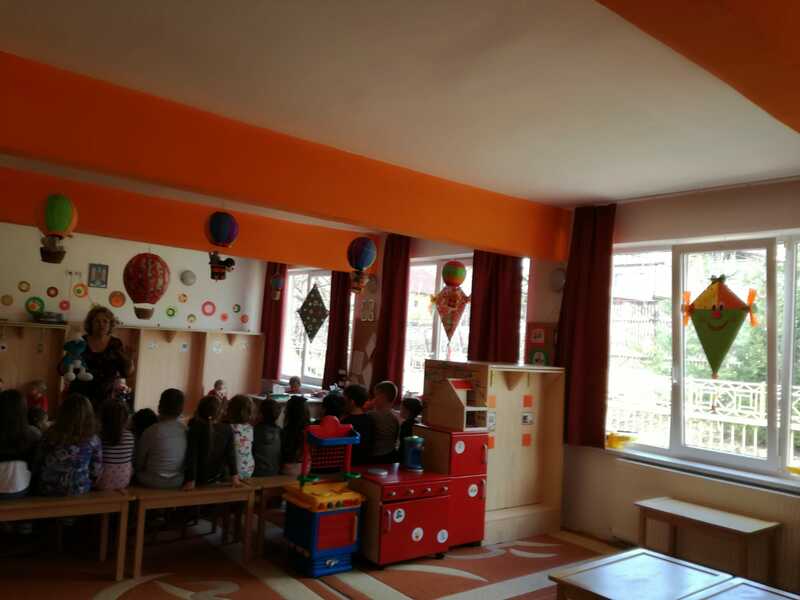 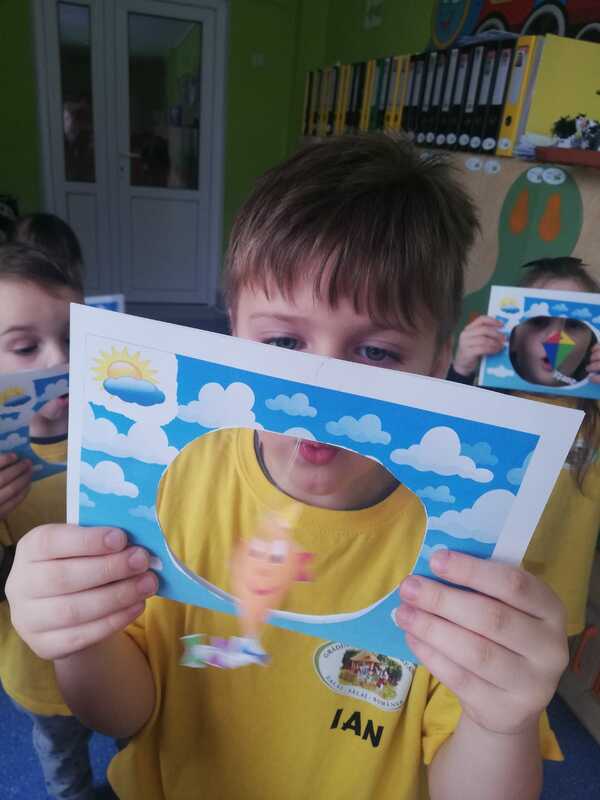 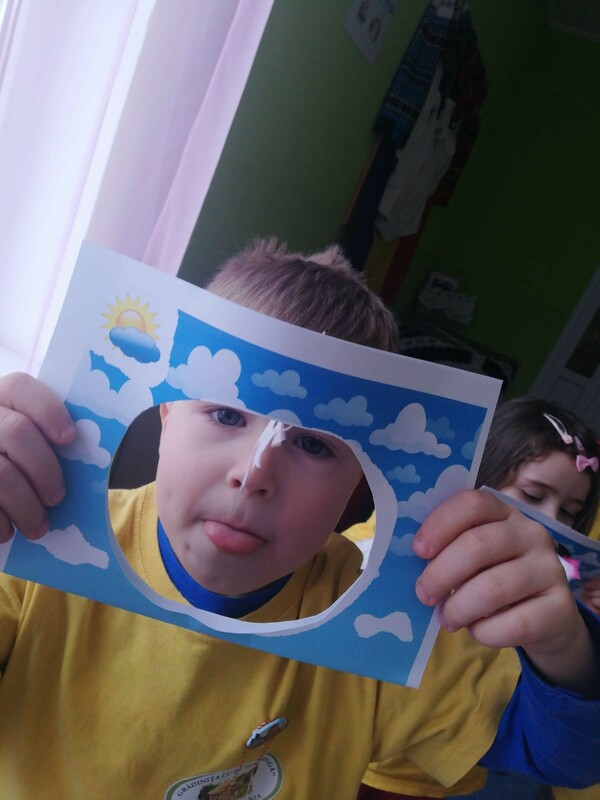 Work Description: The work begins with a visit of Smart smurf mascot of our project that wants to travel in flight to the children in the other partner countries. 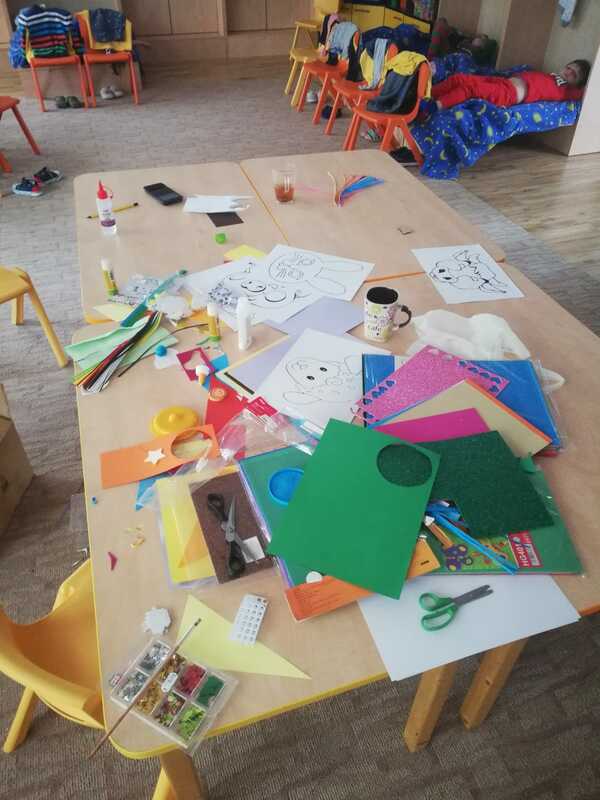 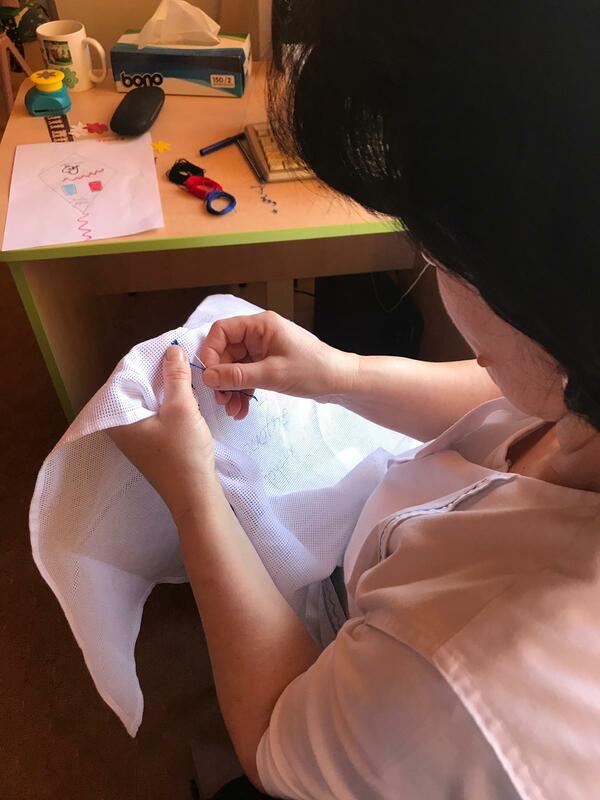 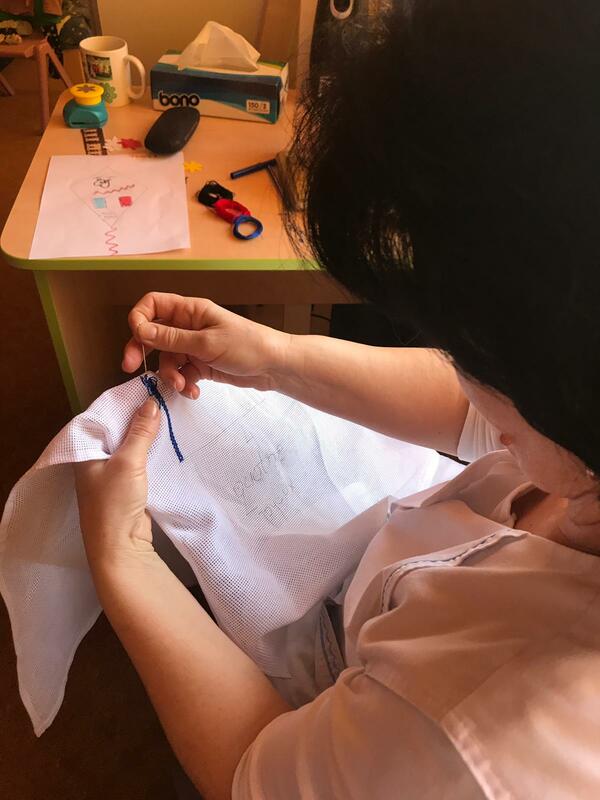 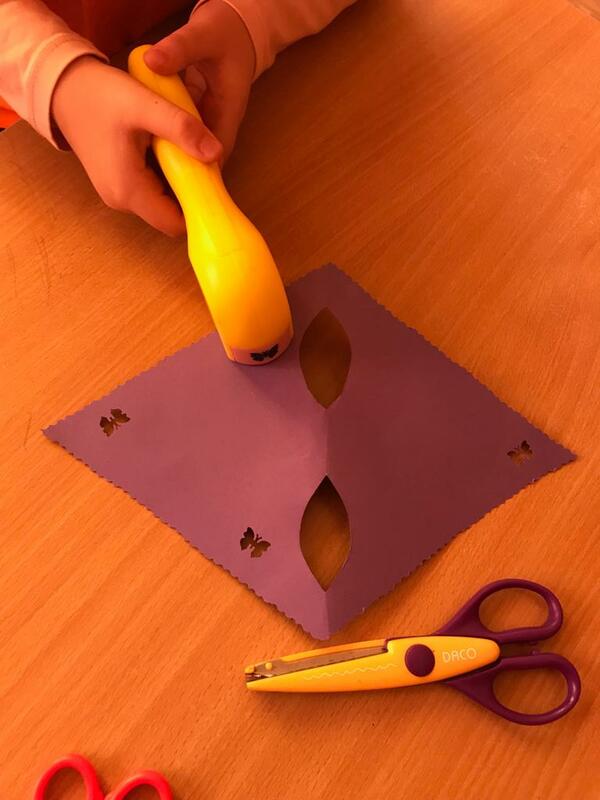 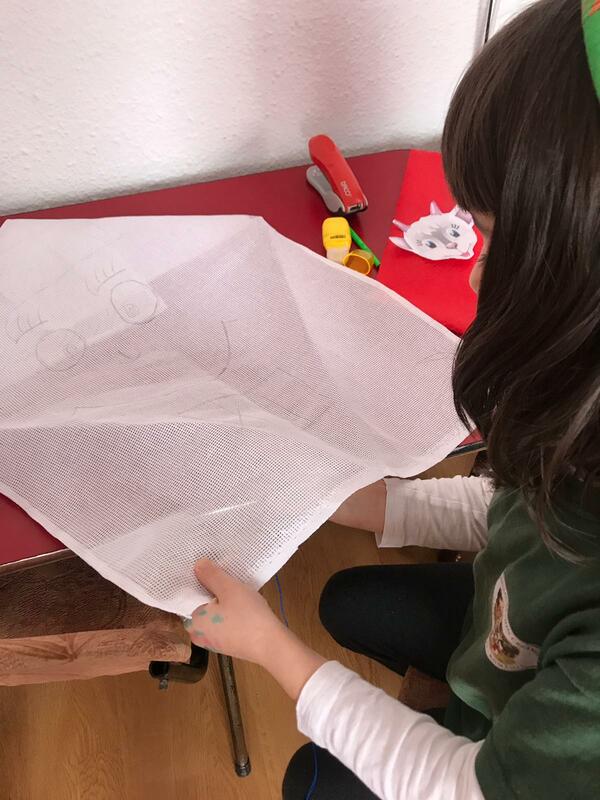 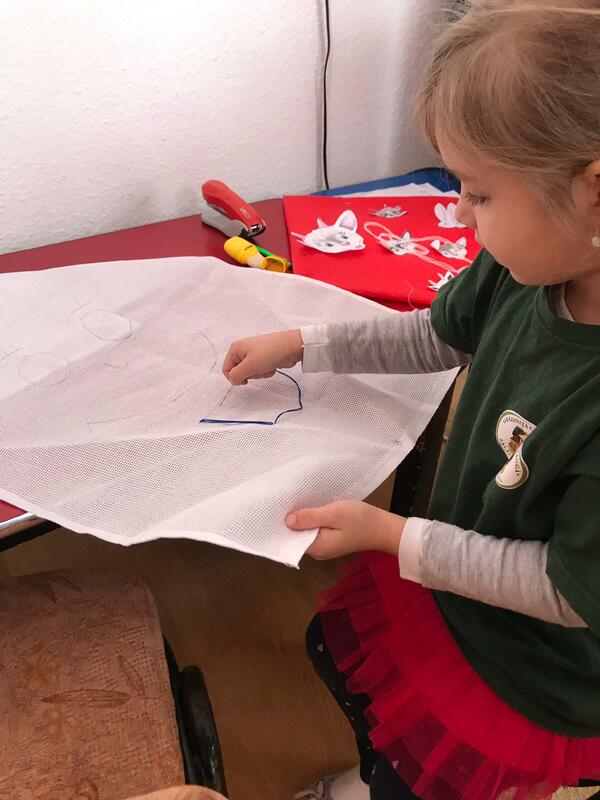 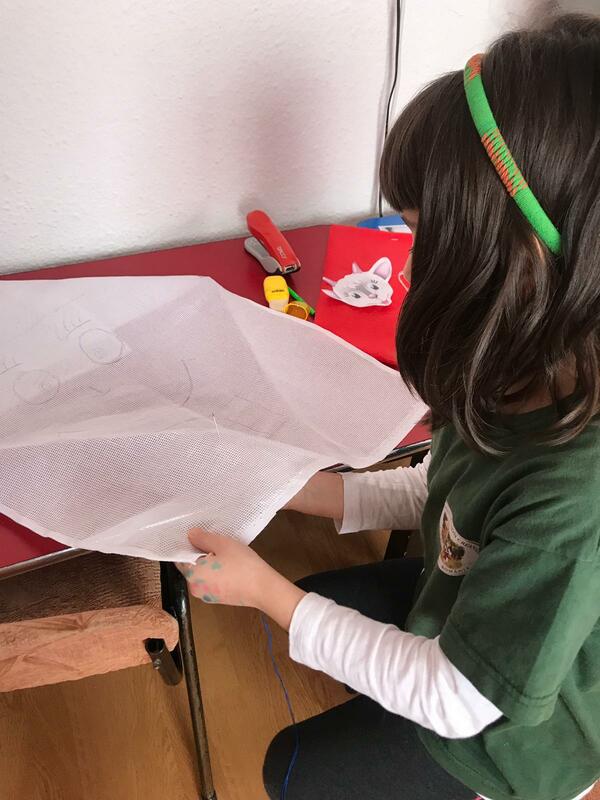 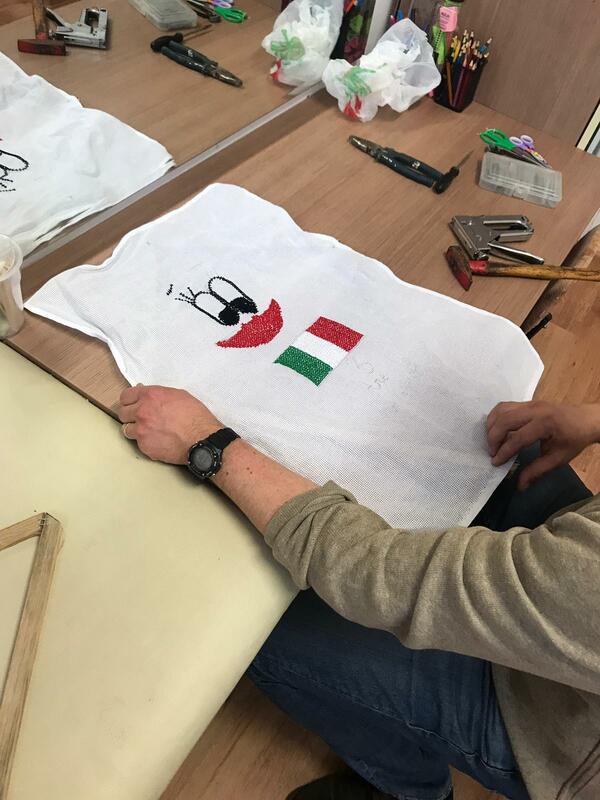 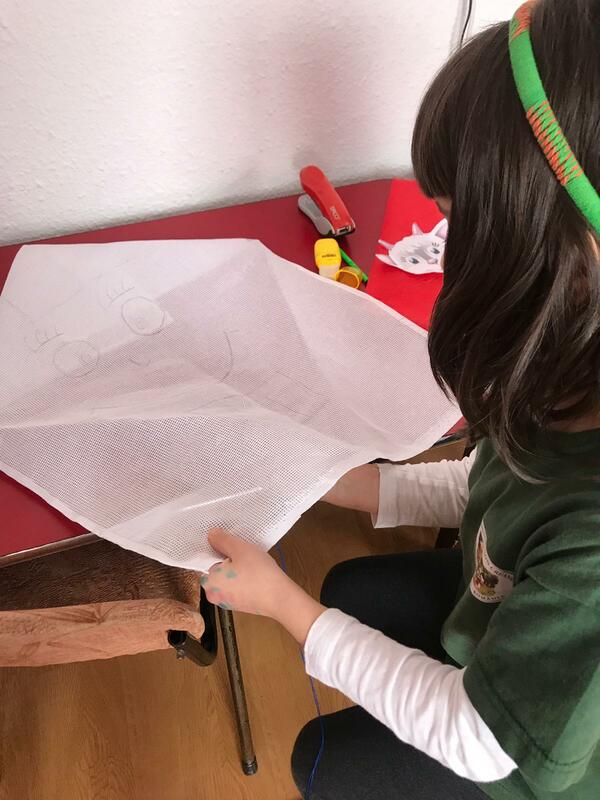 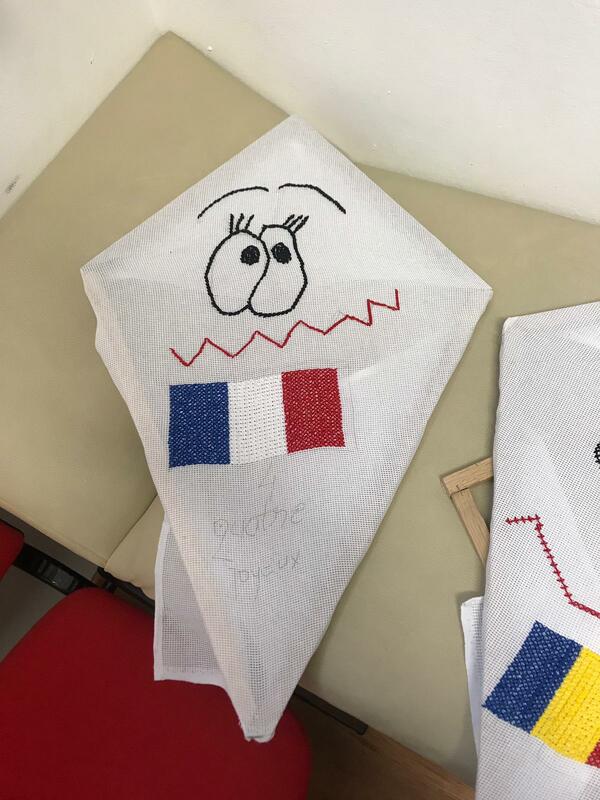 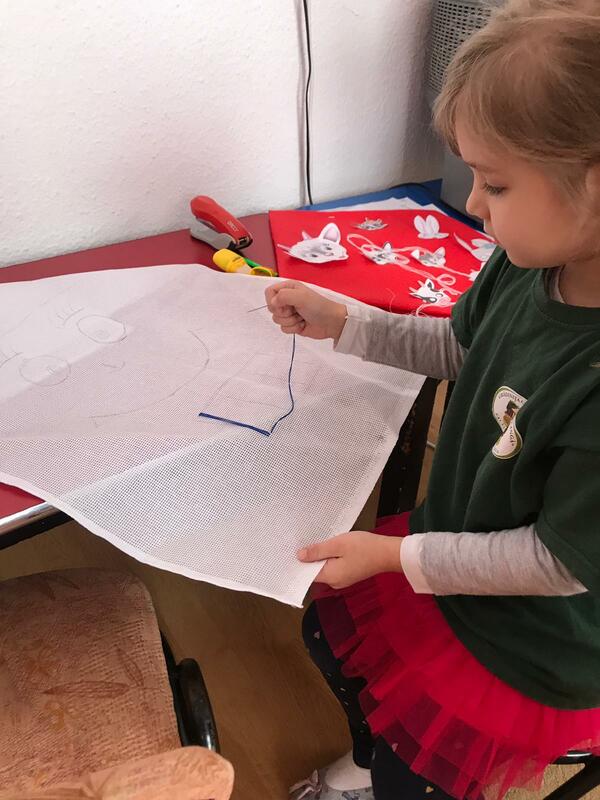 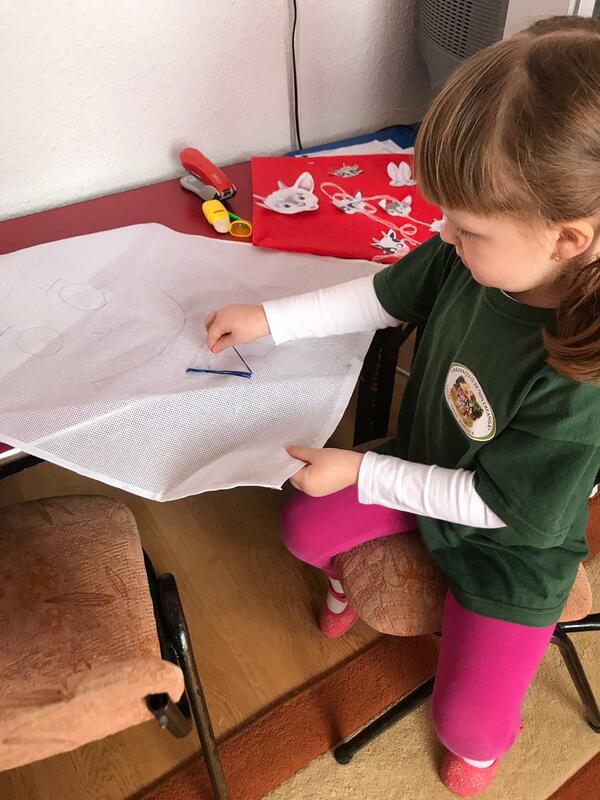 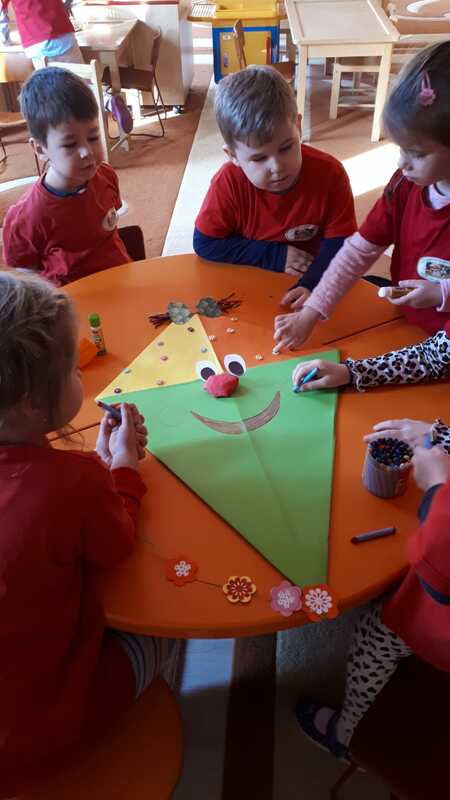 As a surprise to the other partners, we will learn the Smurf build kites flying in the embroidery sheet on which we sew funny faces, figures and flags of partner countries. 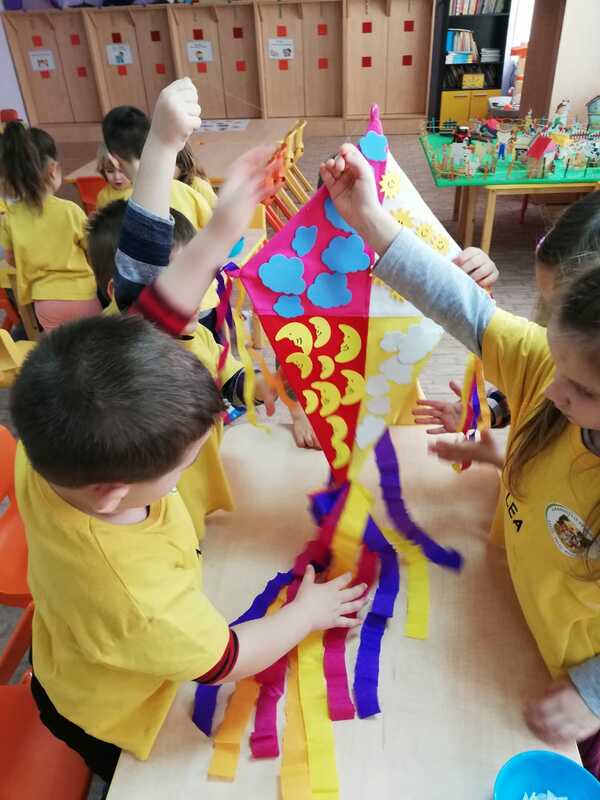 We will show children how to work, we perform warm-up exercises the small muscles of the hand, then we sew the four kite flying. 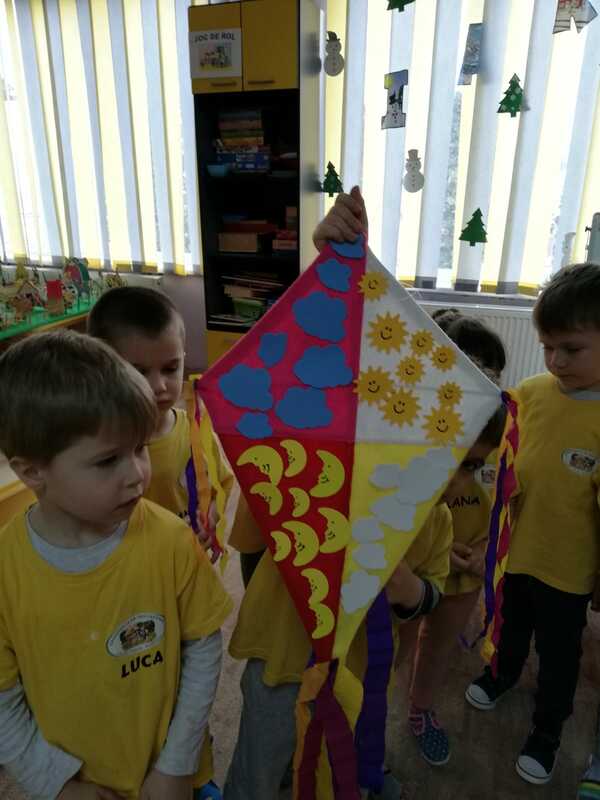 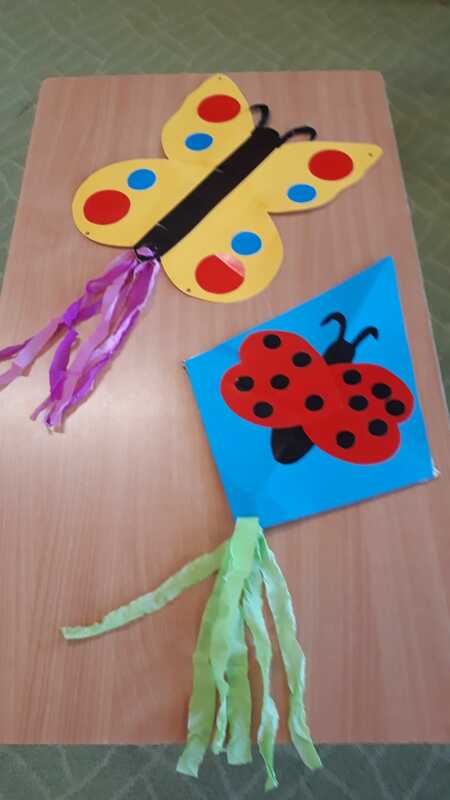 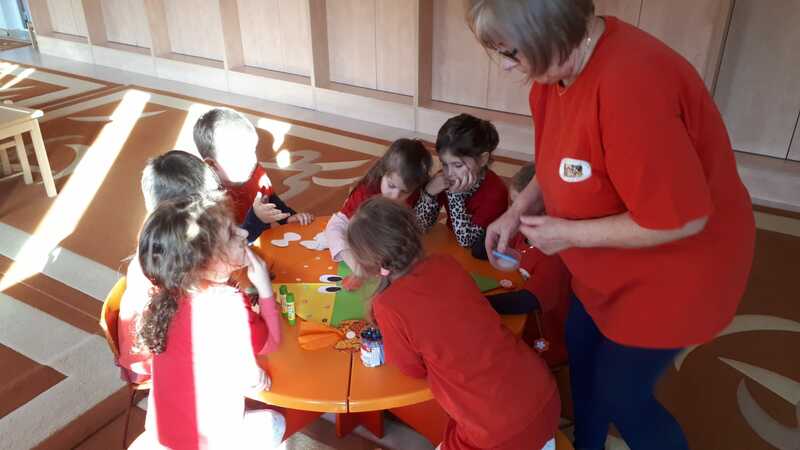 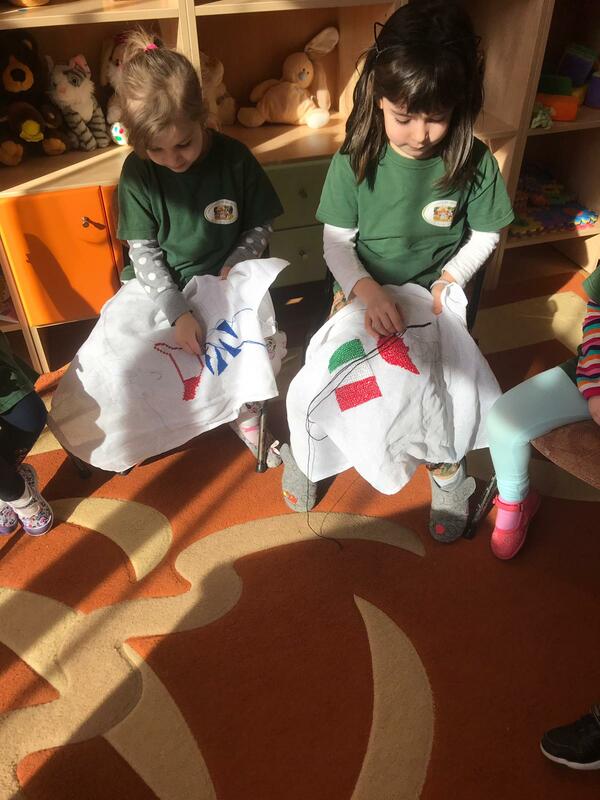 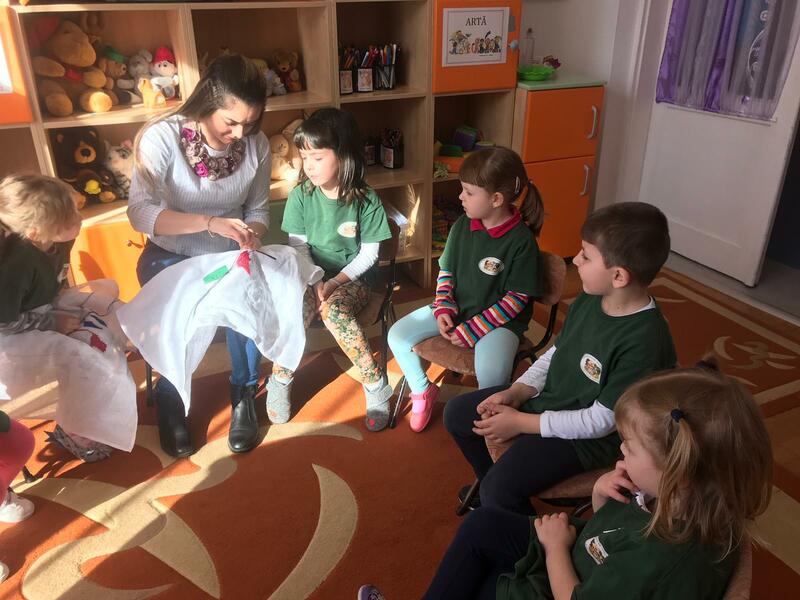 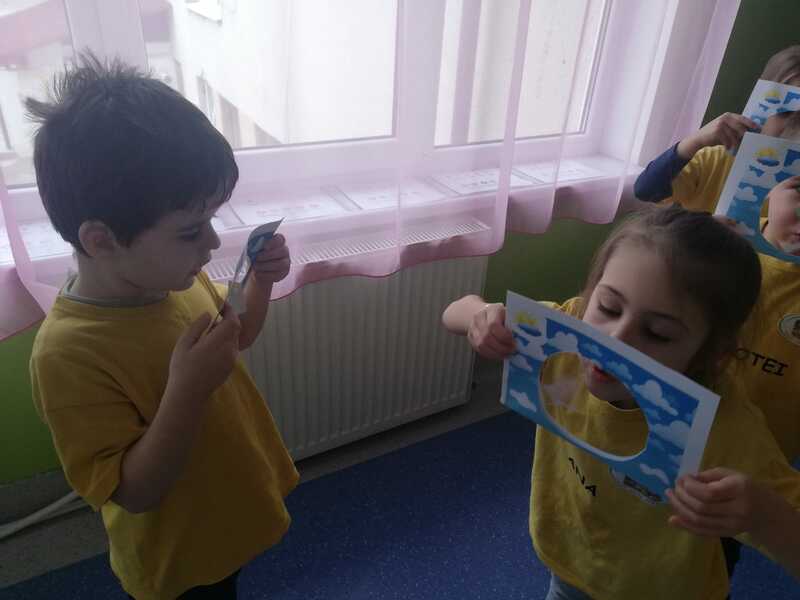 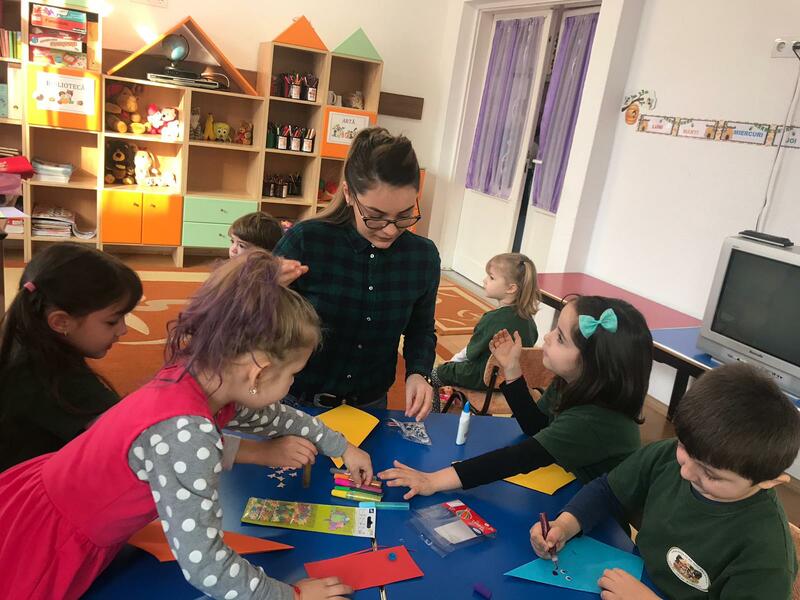 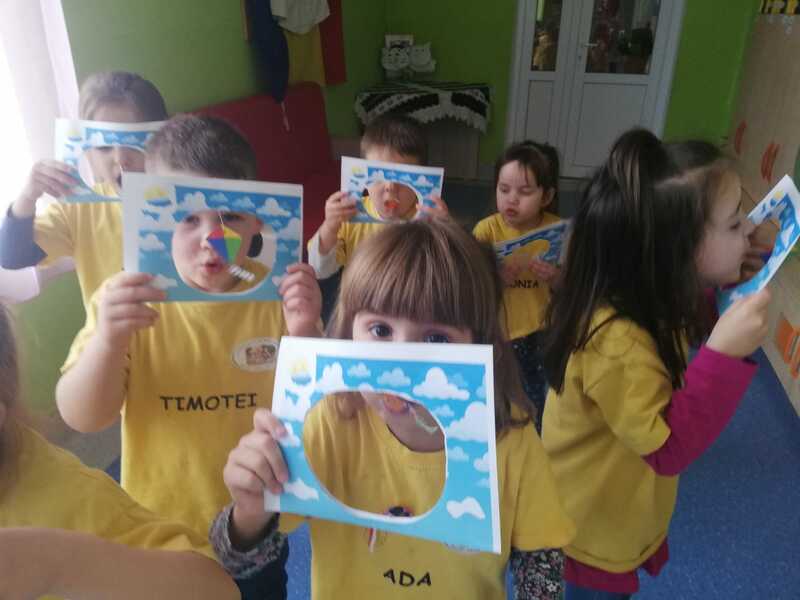 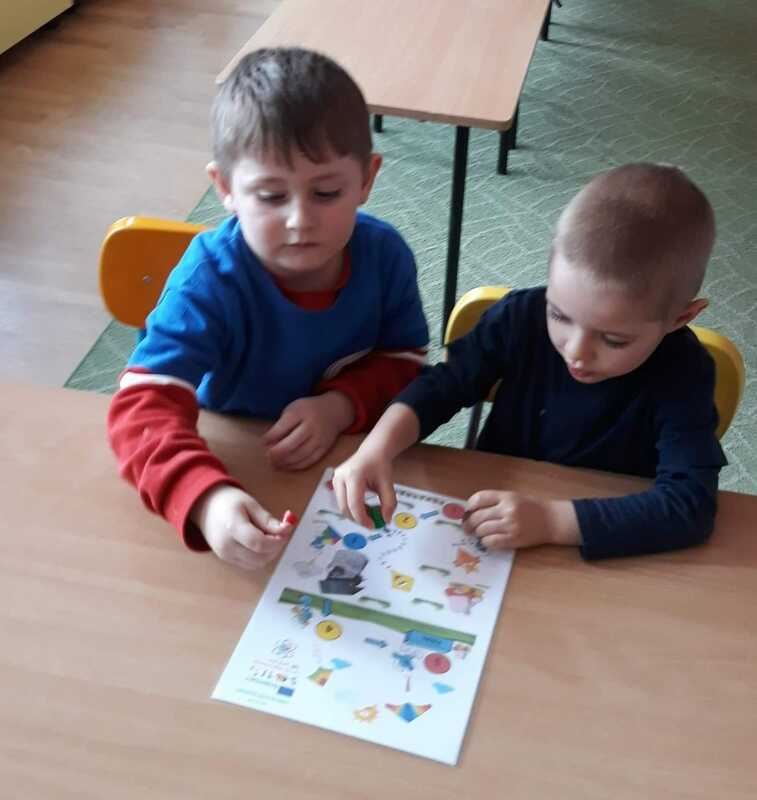 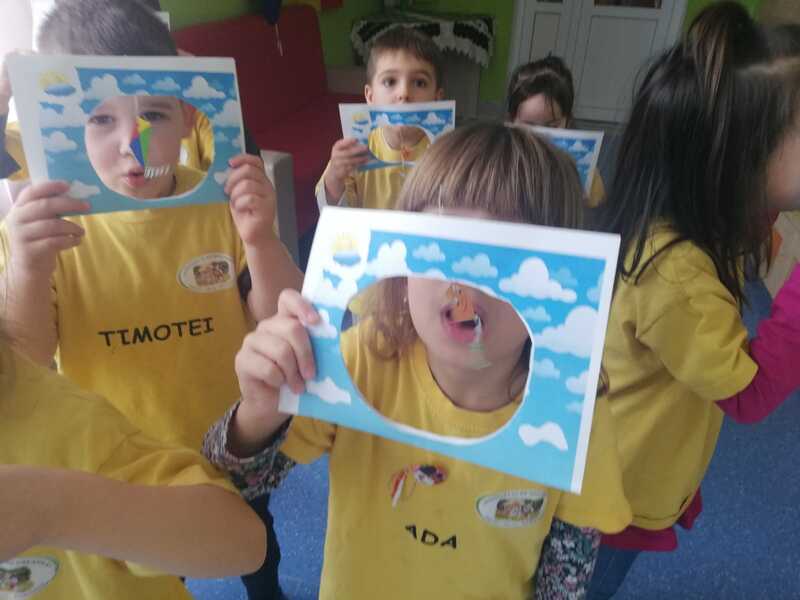 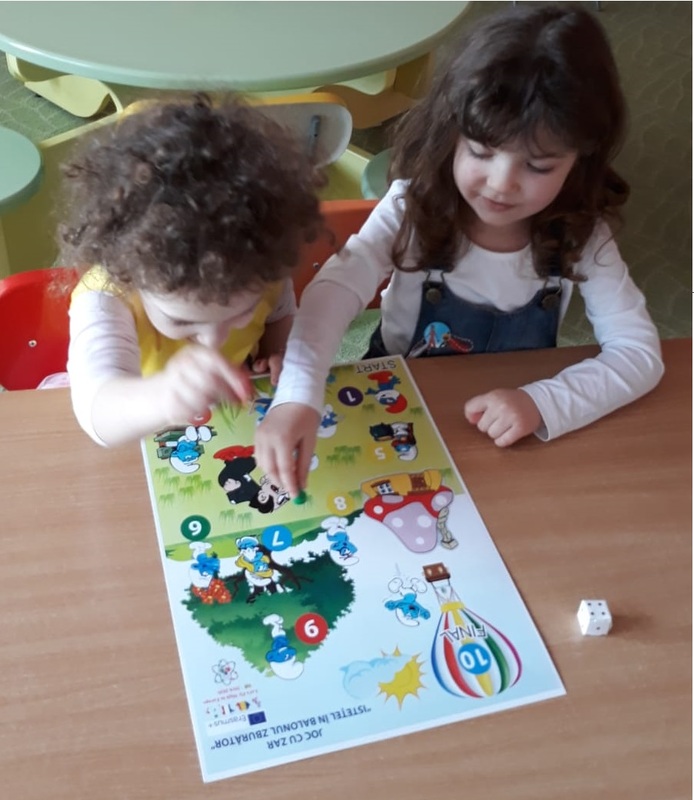 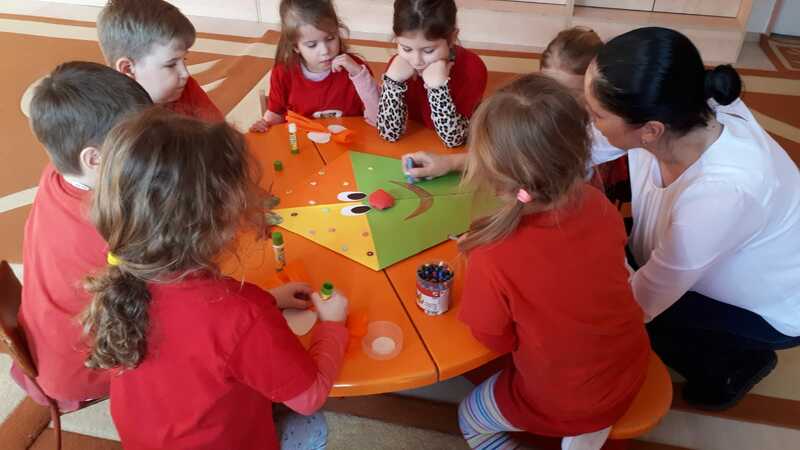 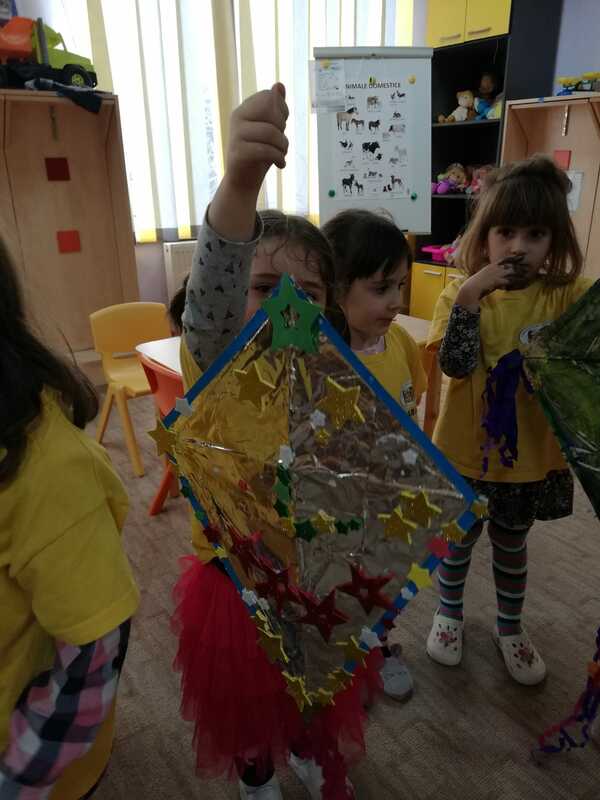 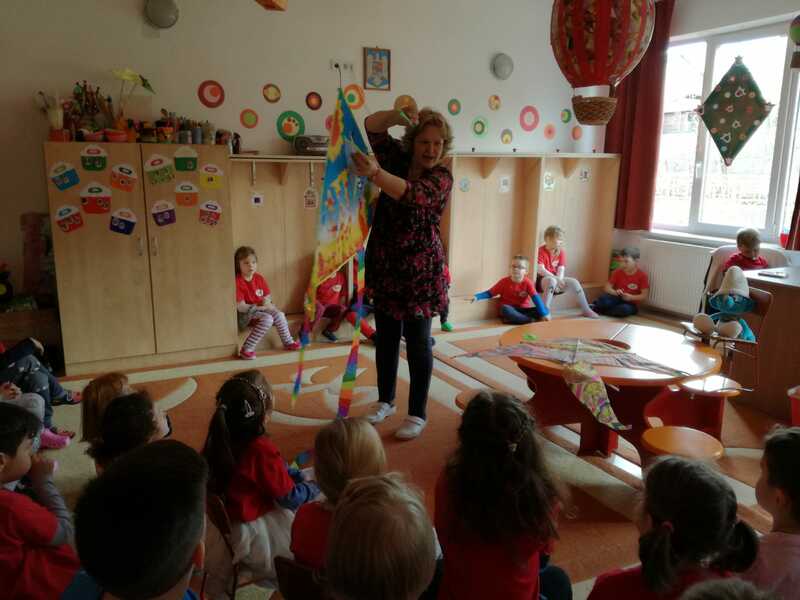 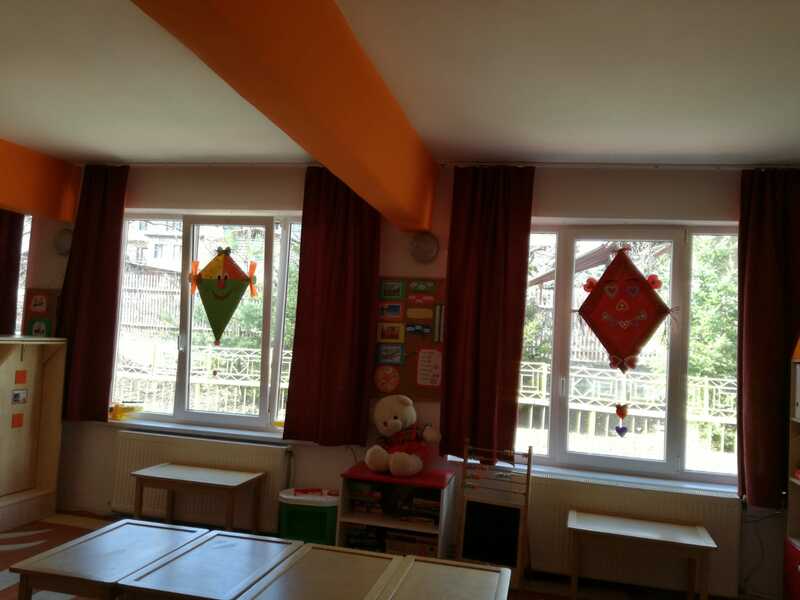 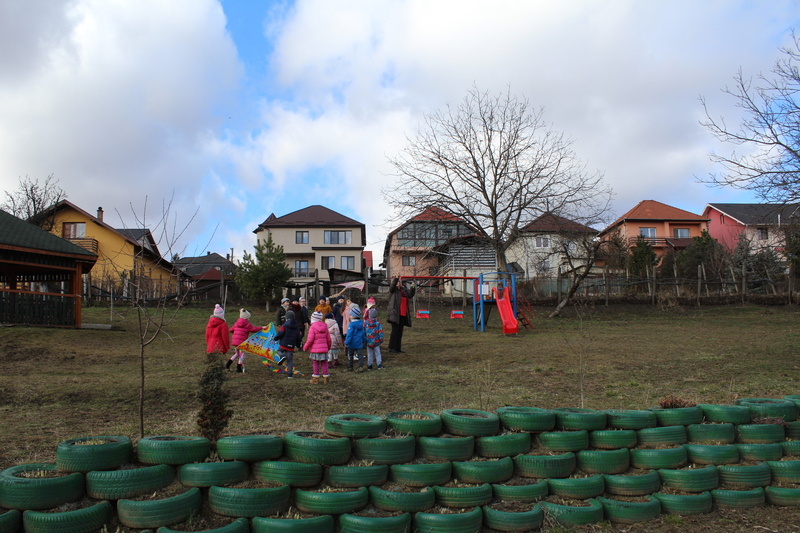 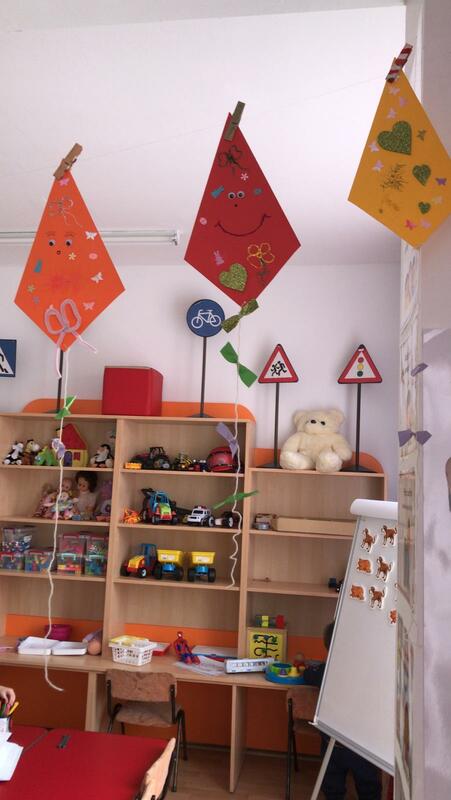 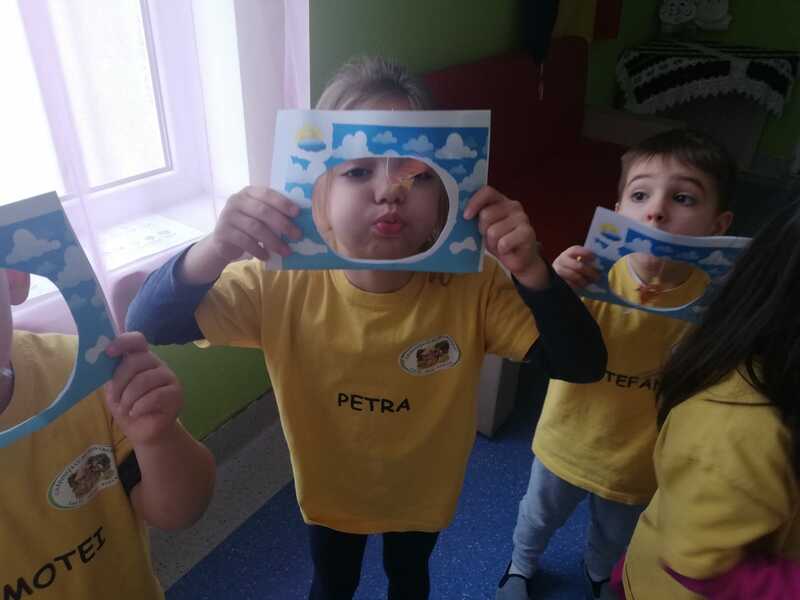 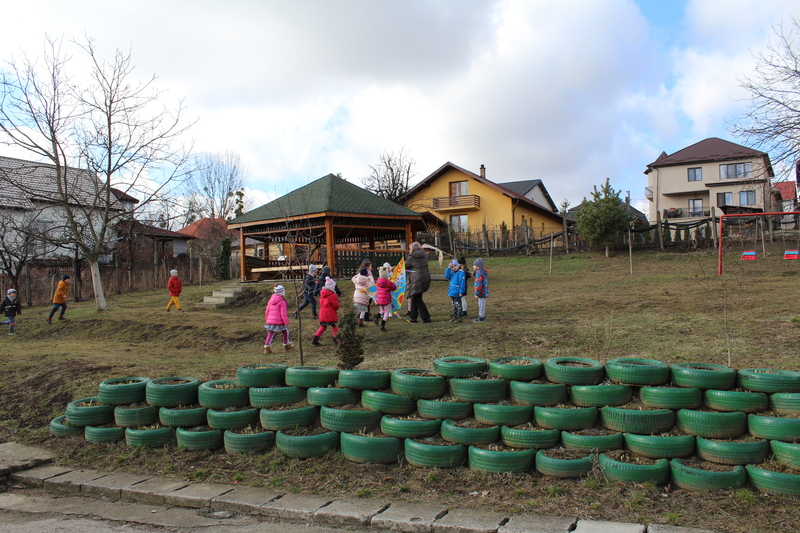 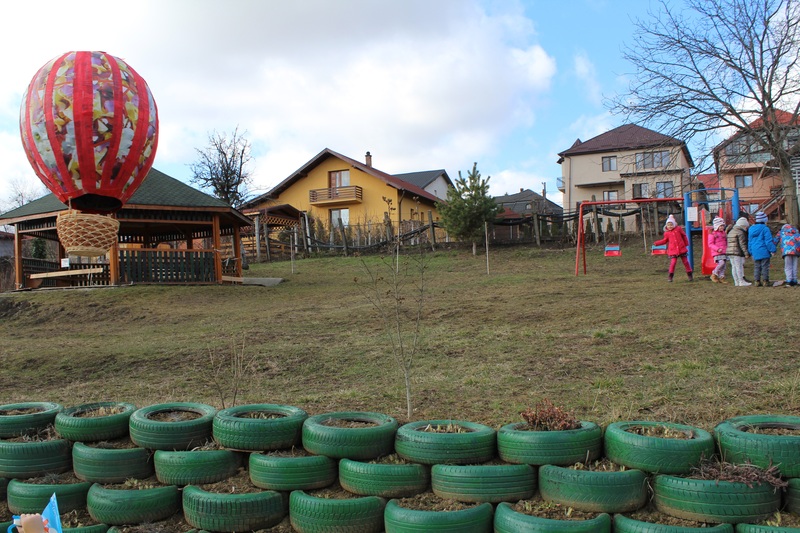 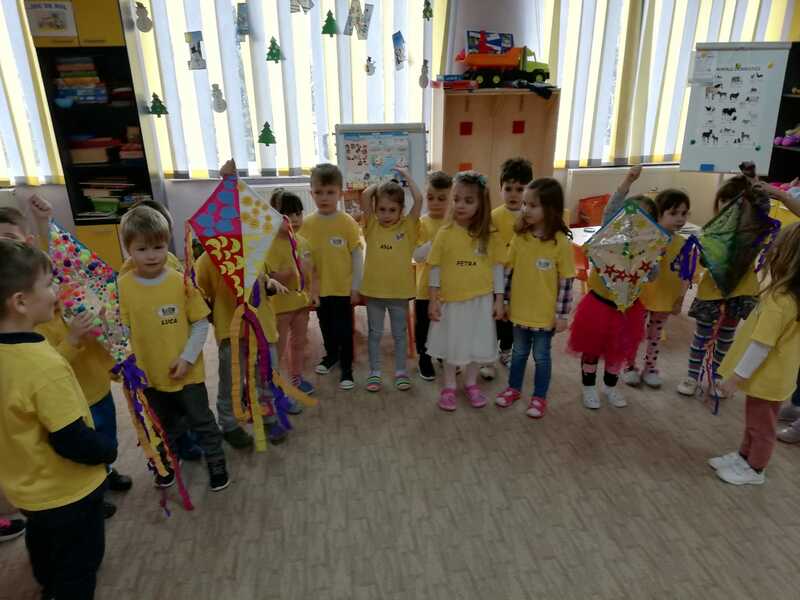 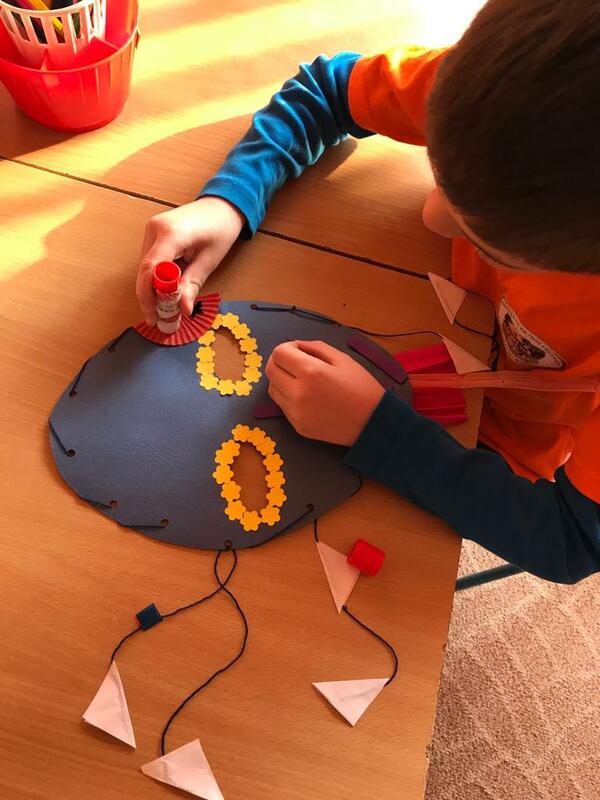 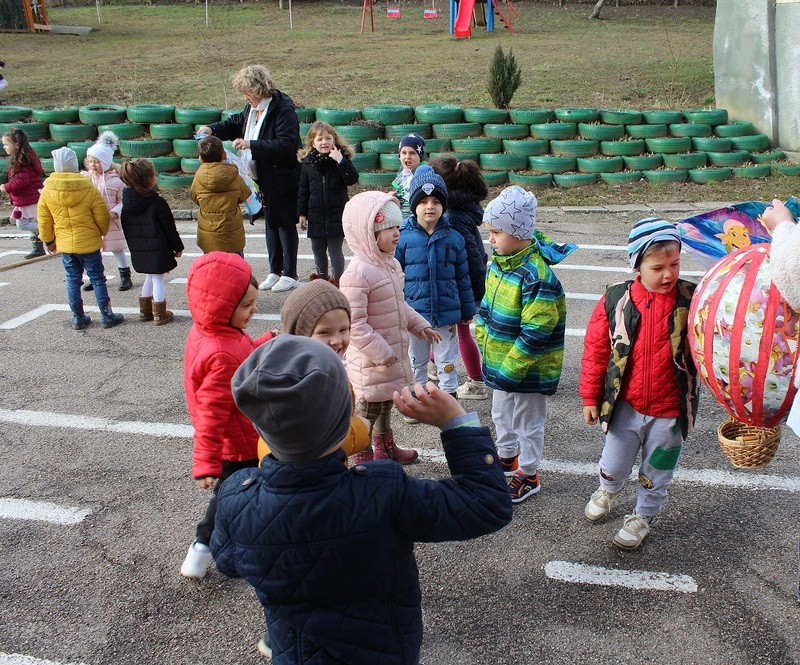 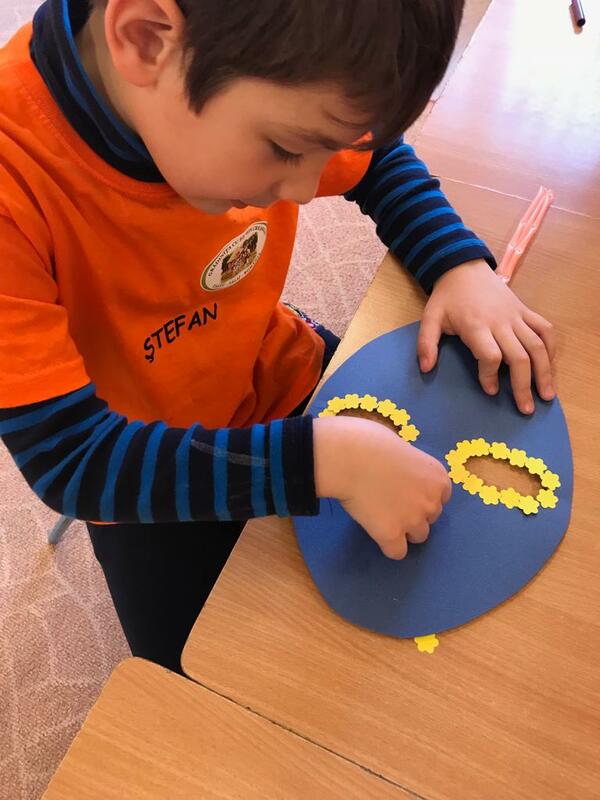 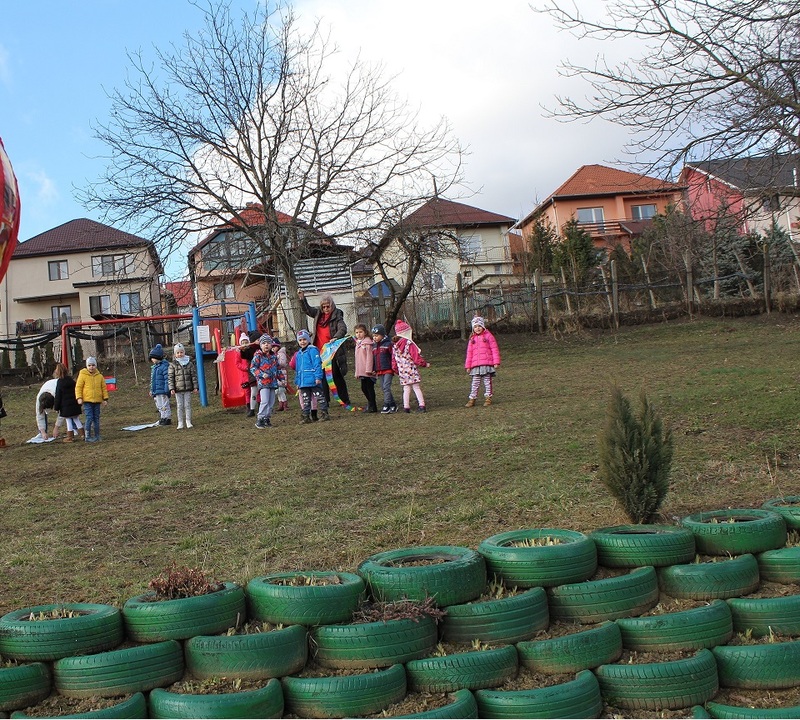 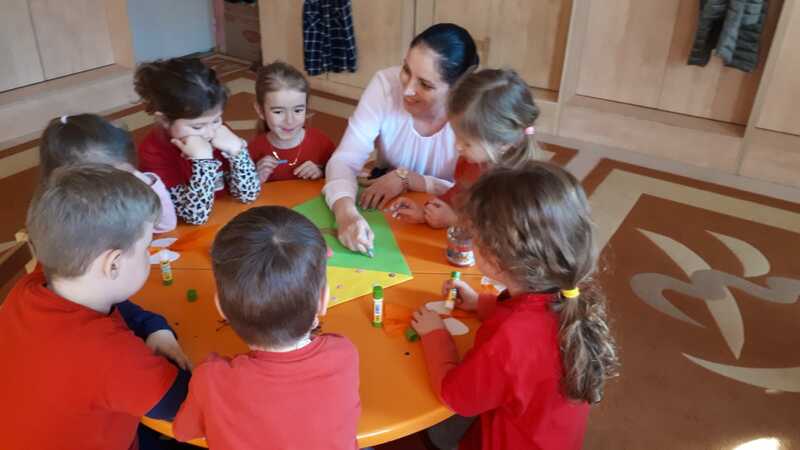 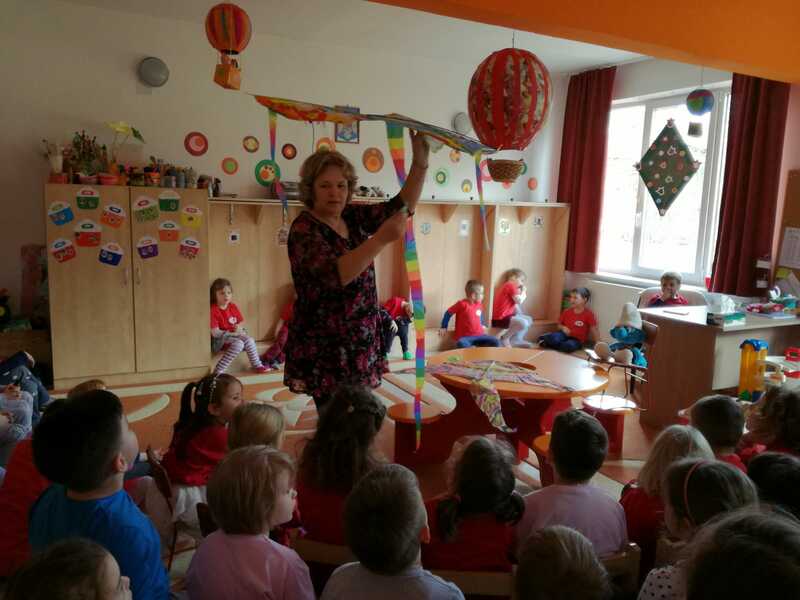 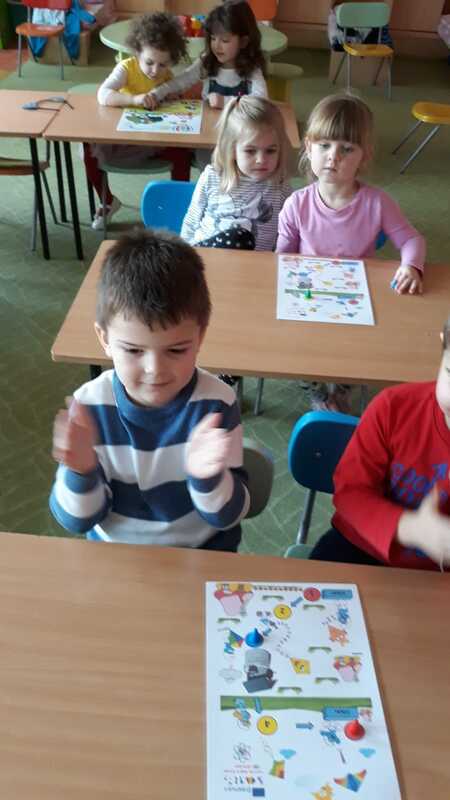 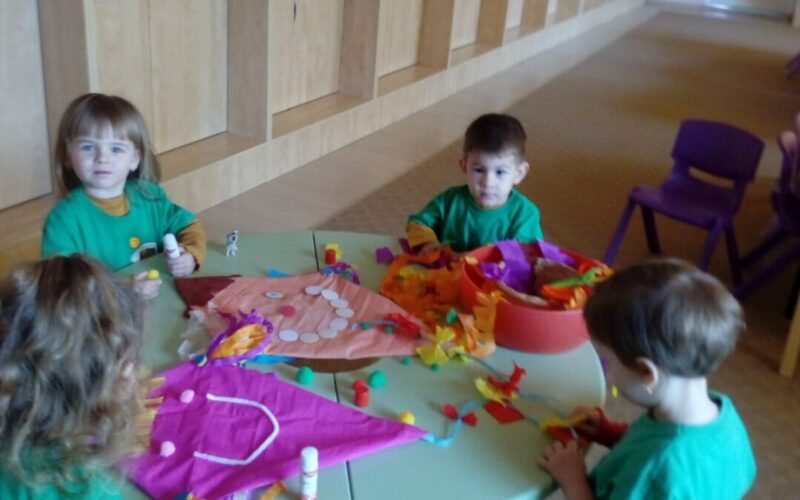 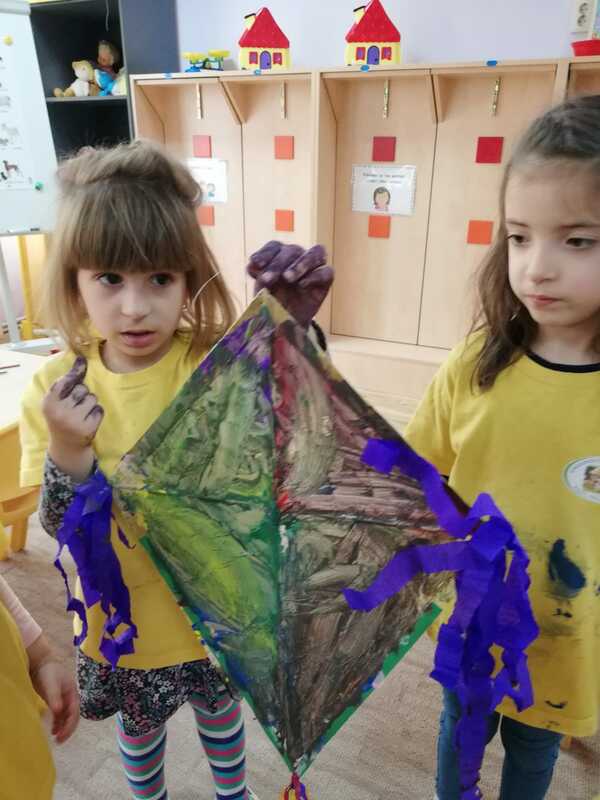 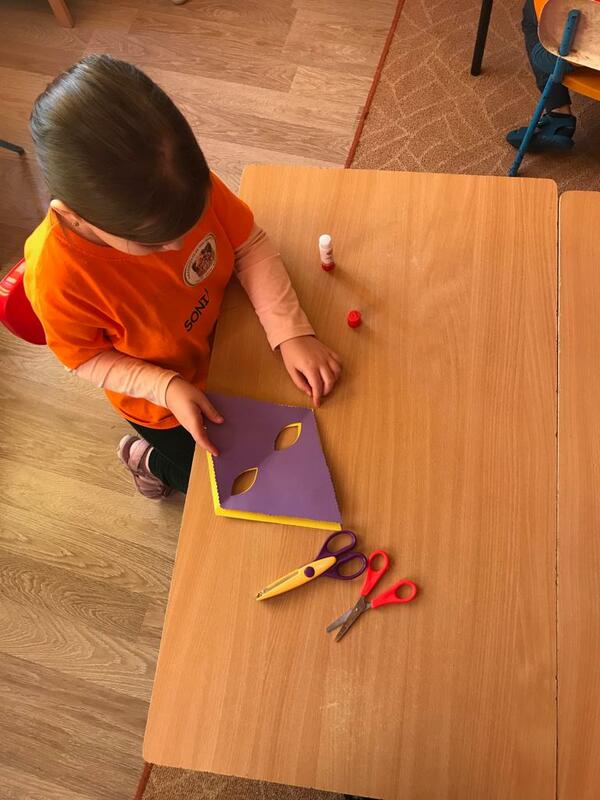 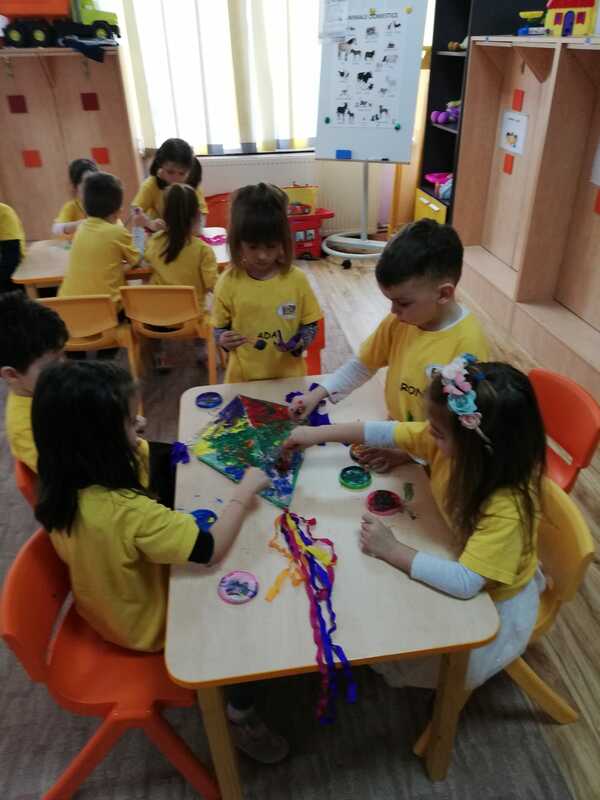 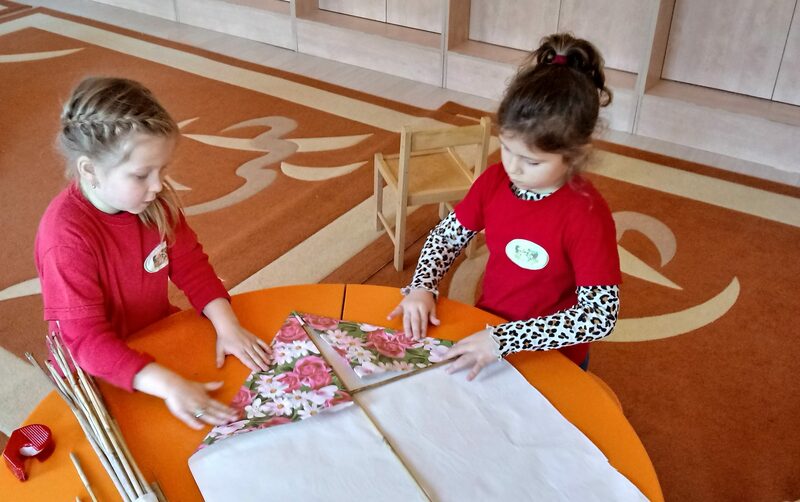 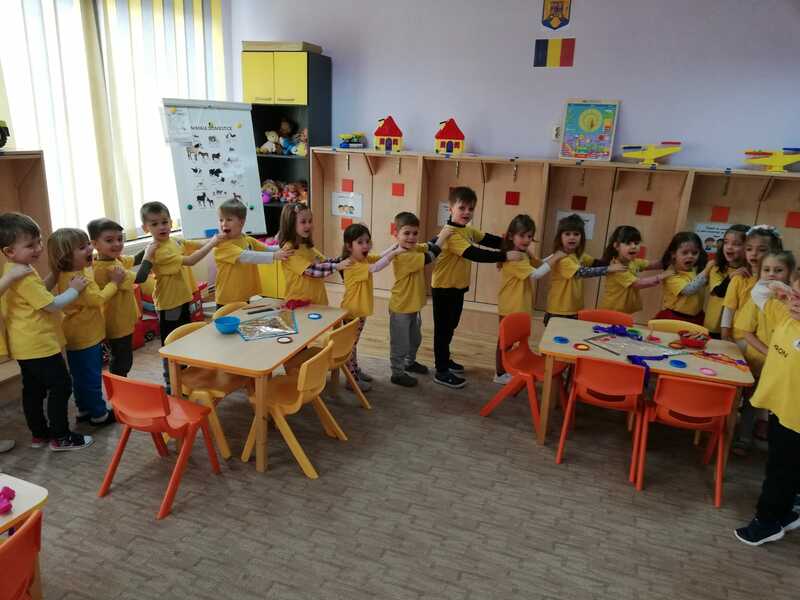 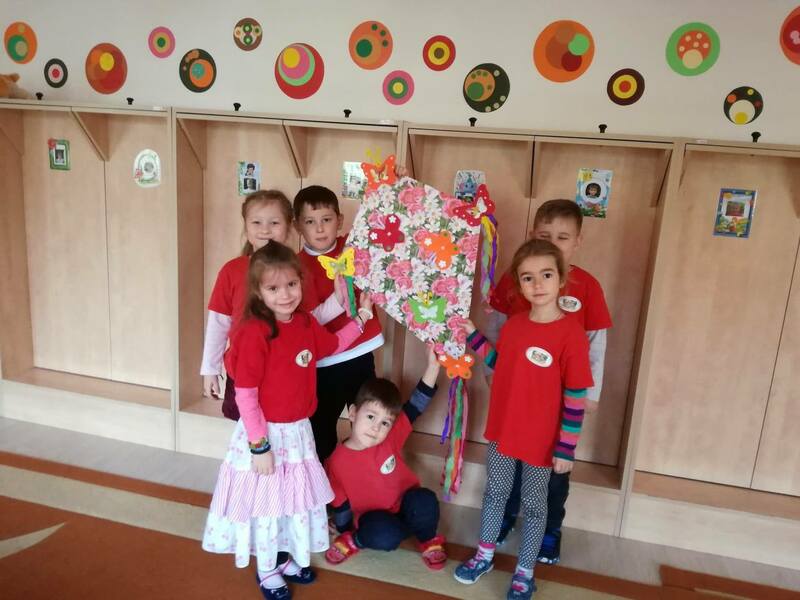 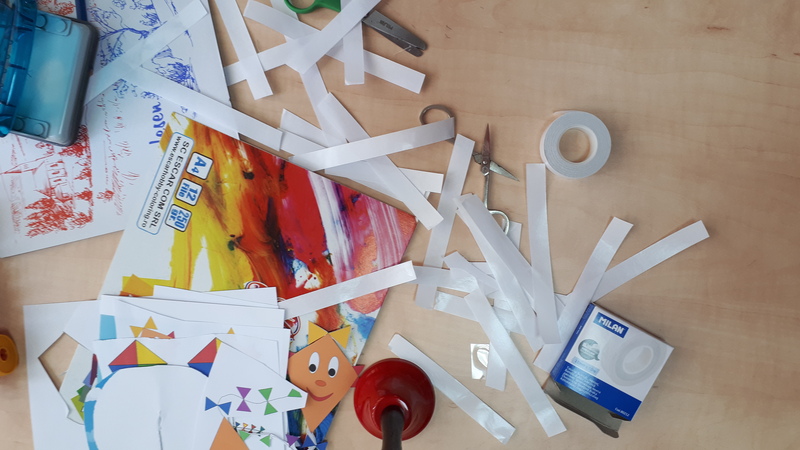 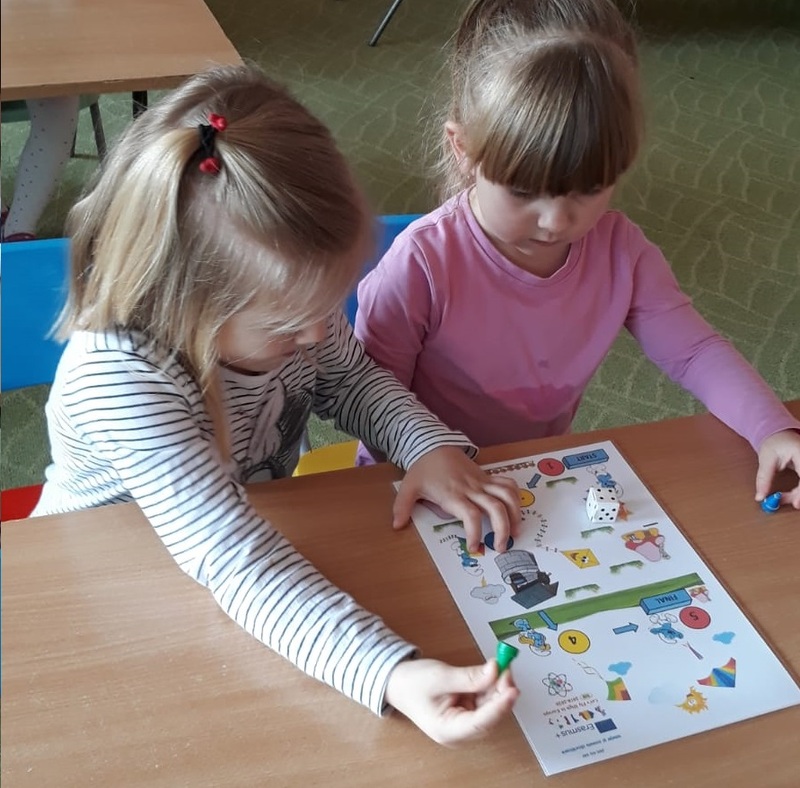 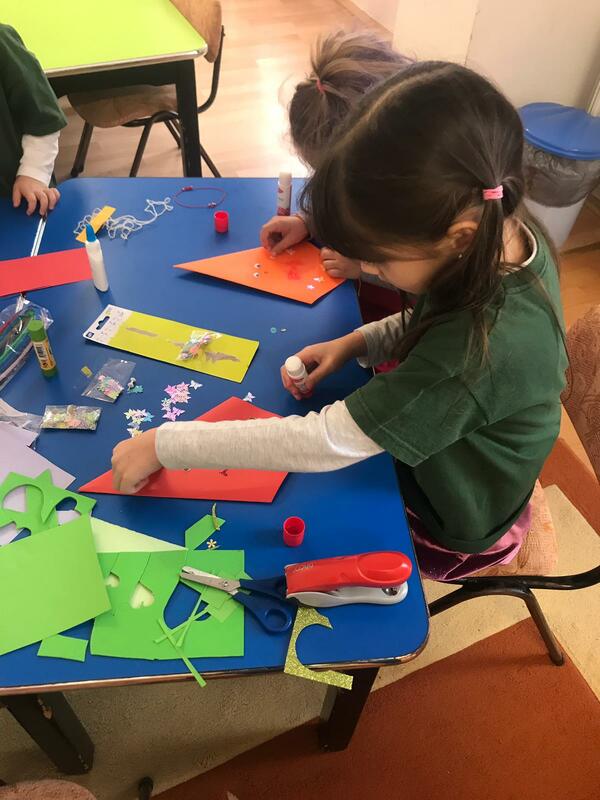 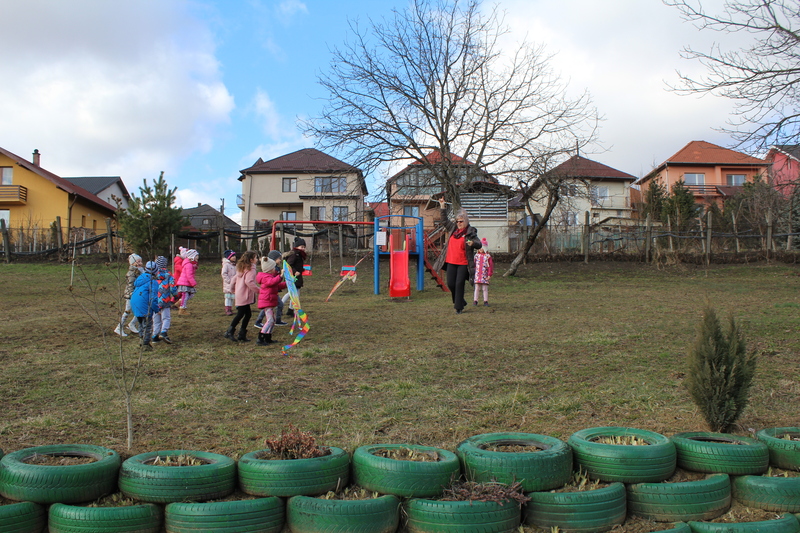 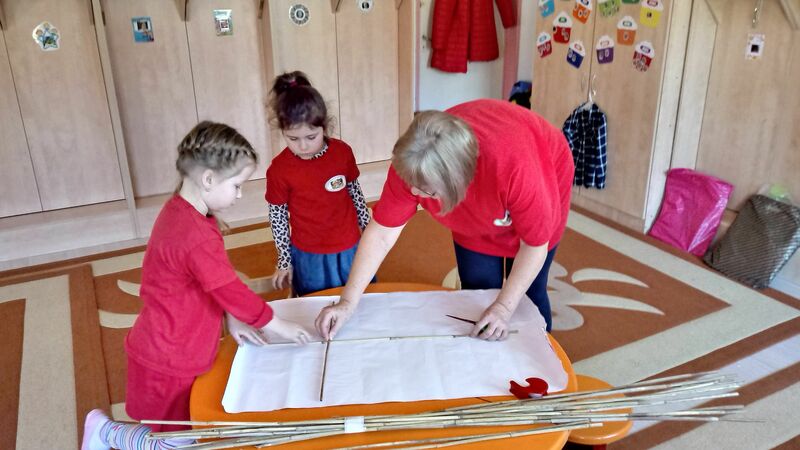 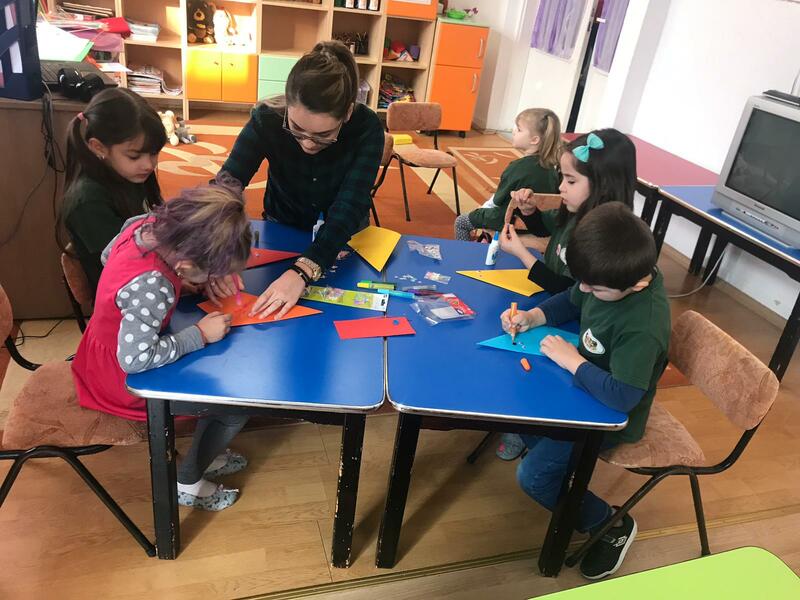 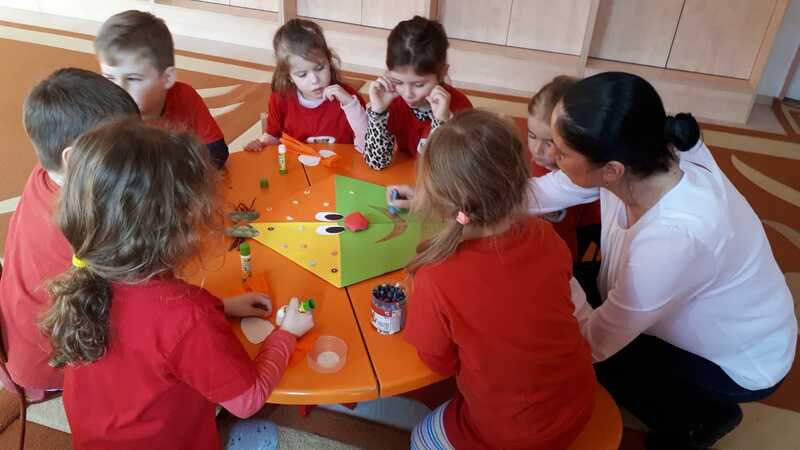 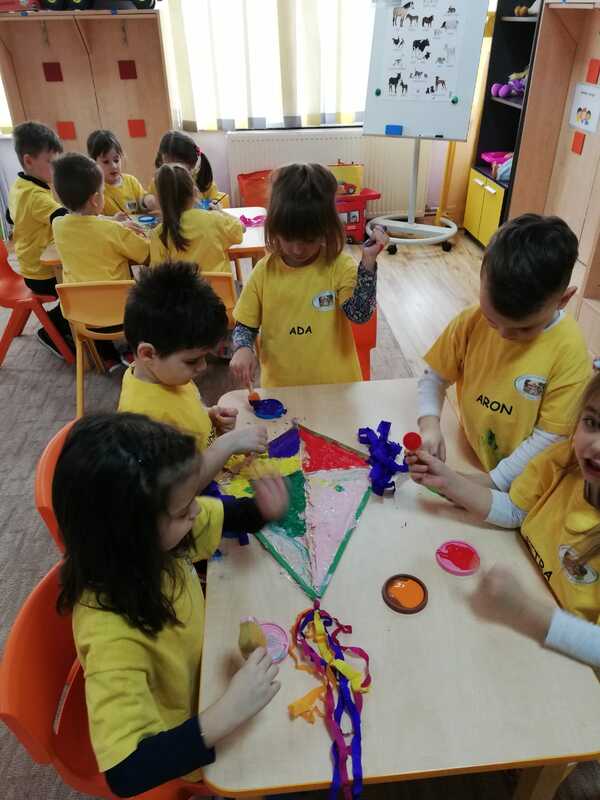 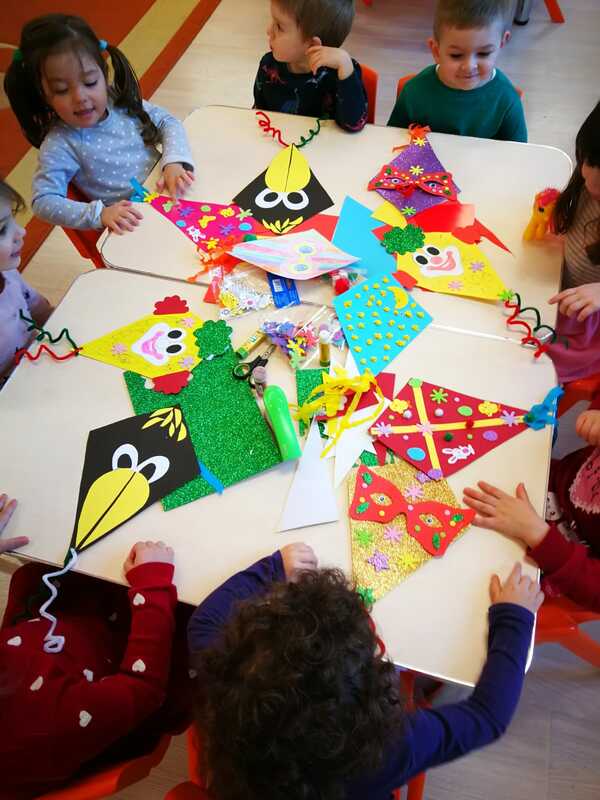 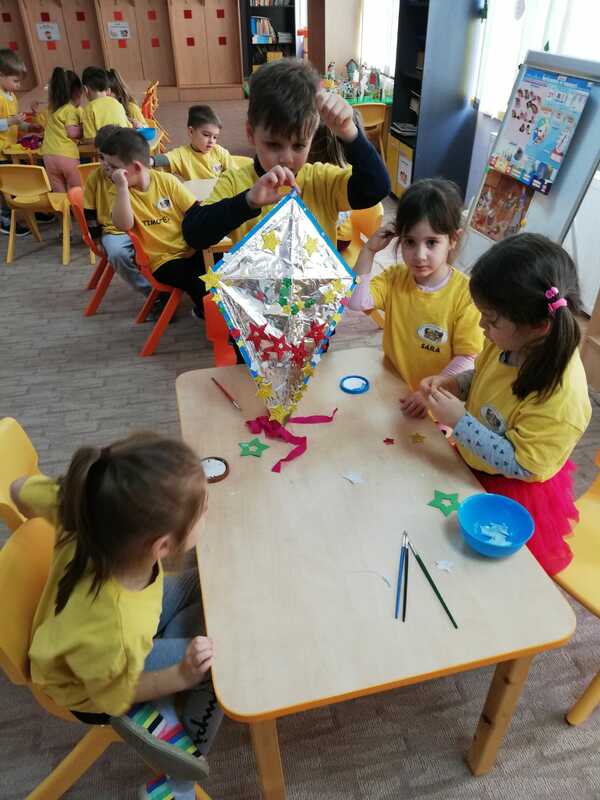 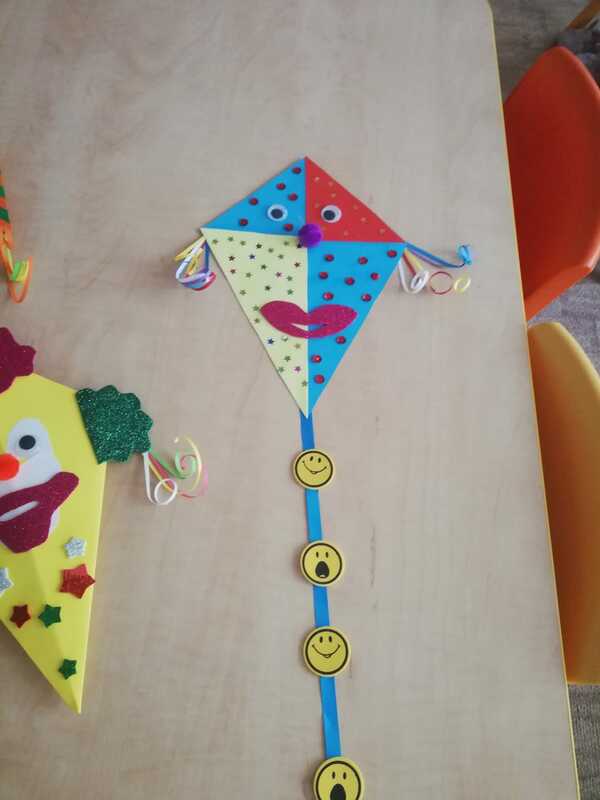 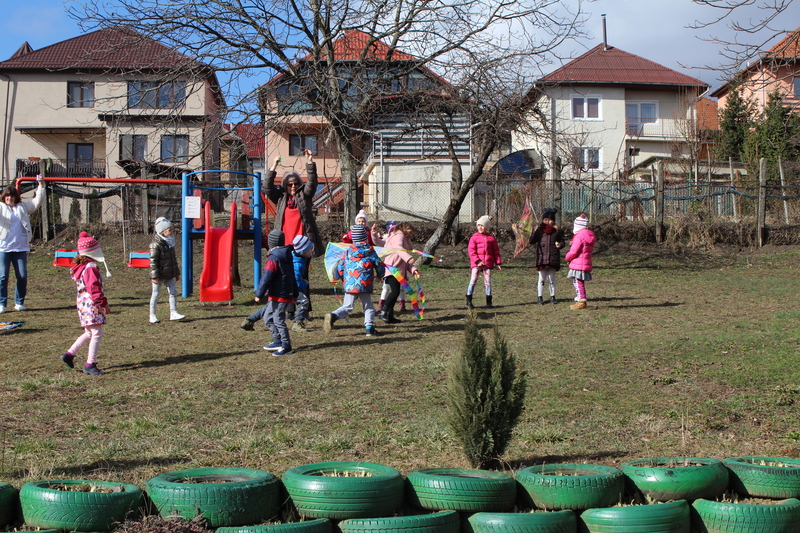 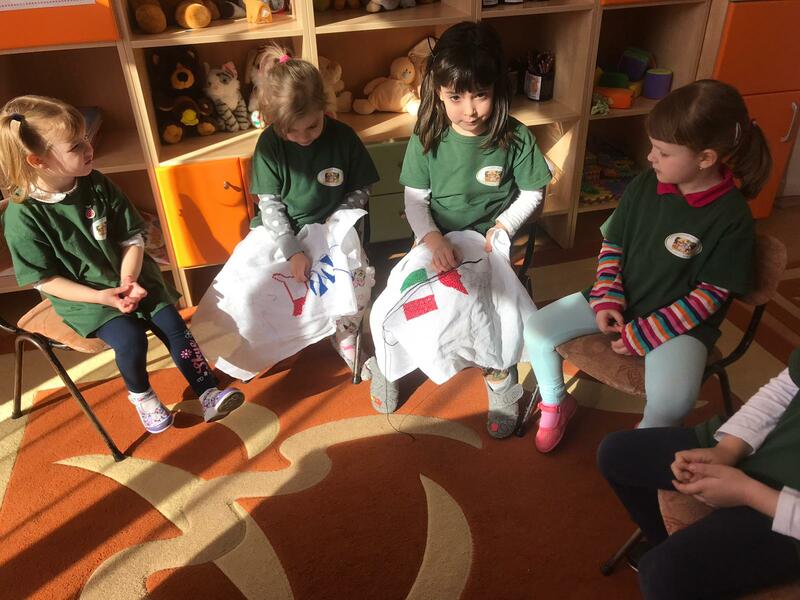 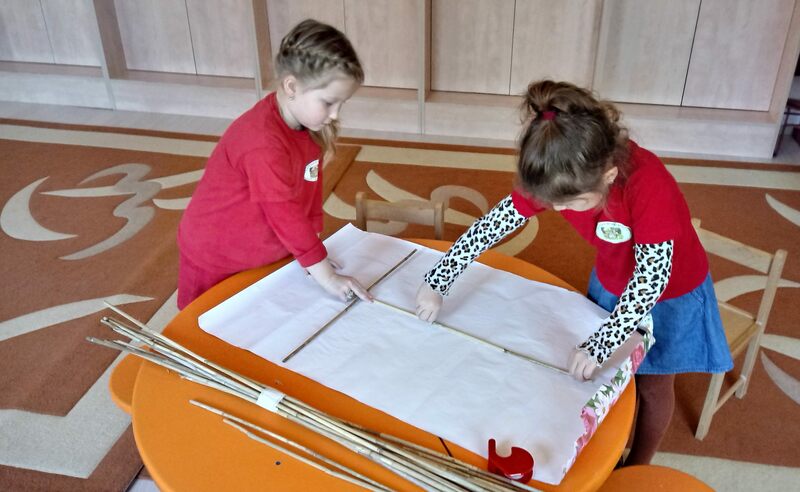 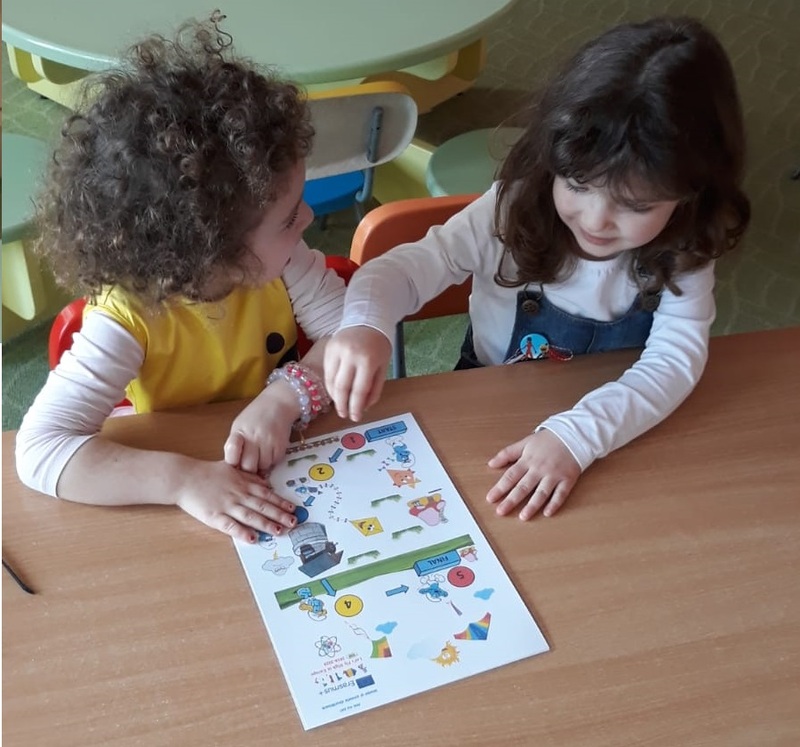 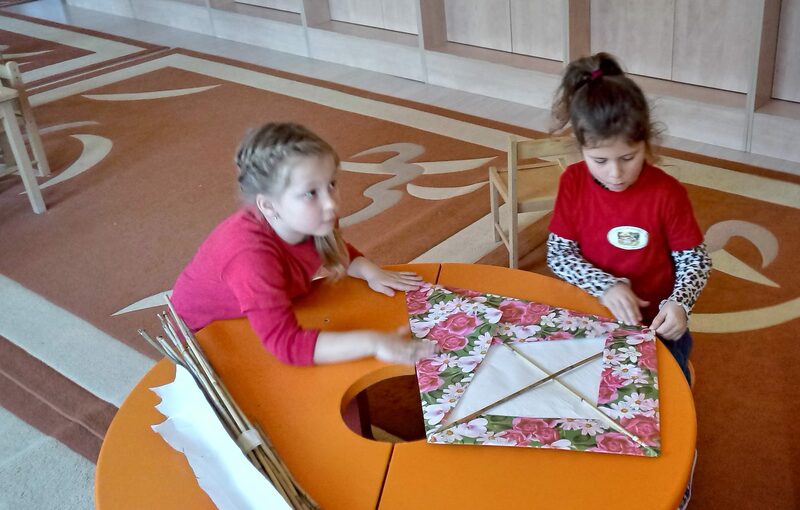 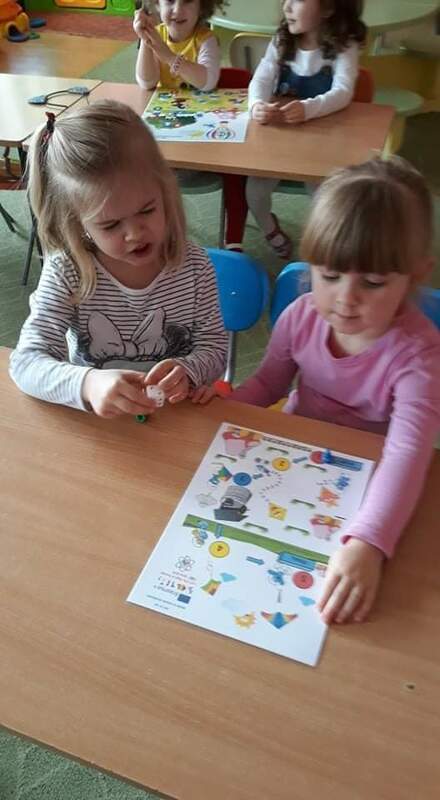 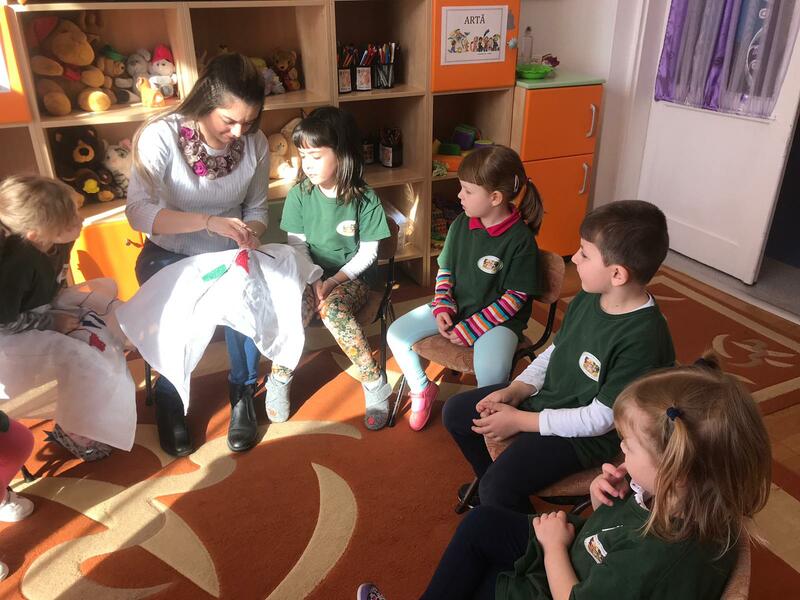 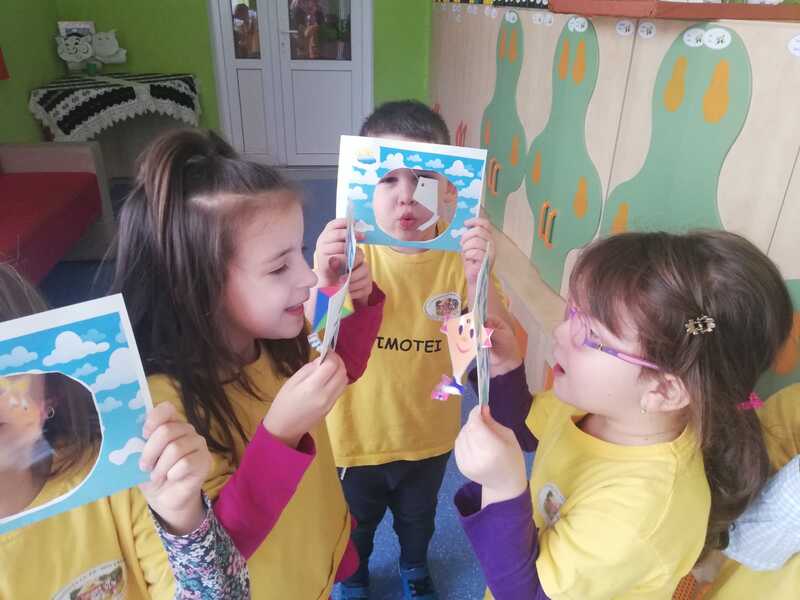 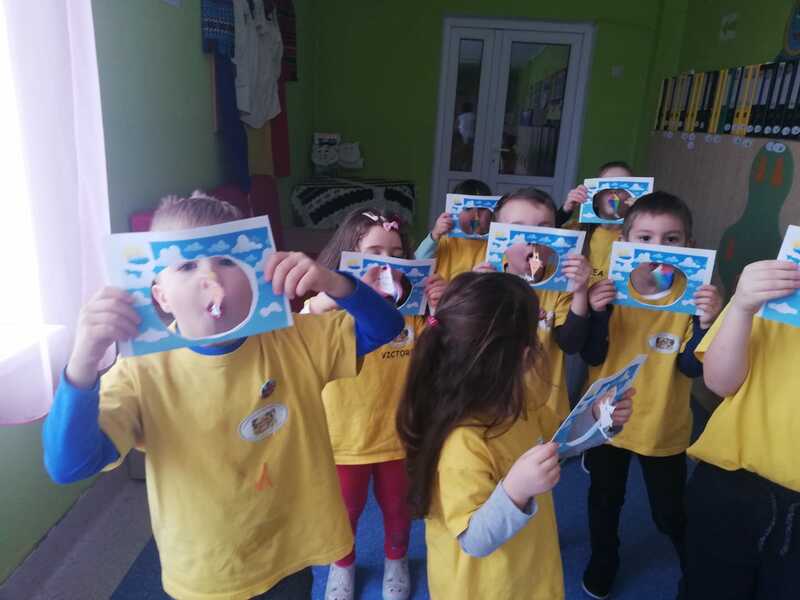 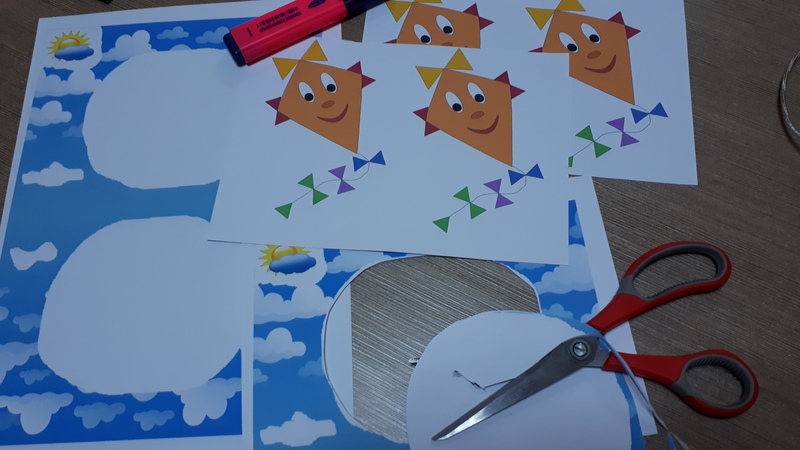 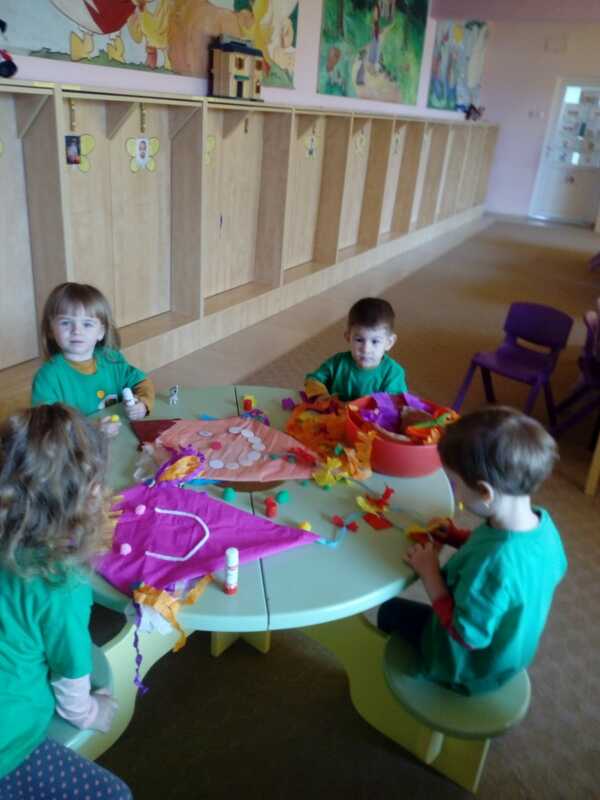 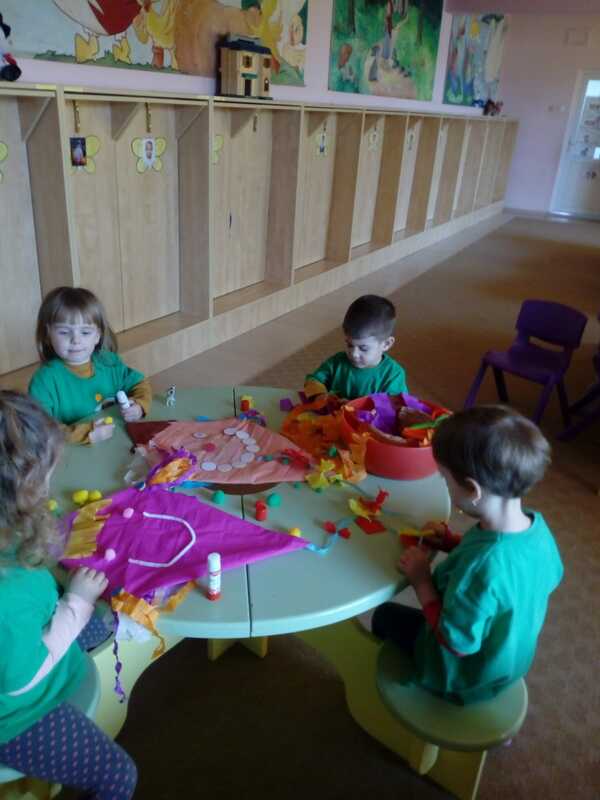 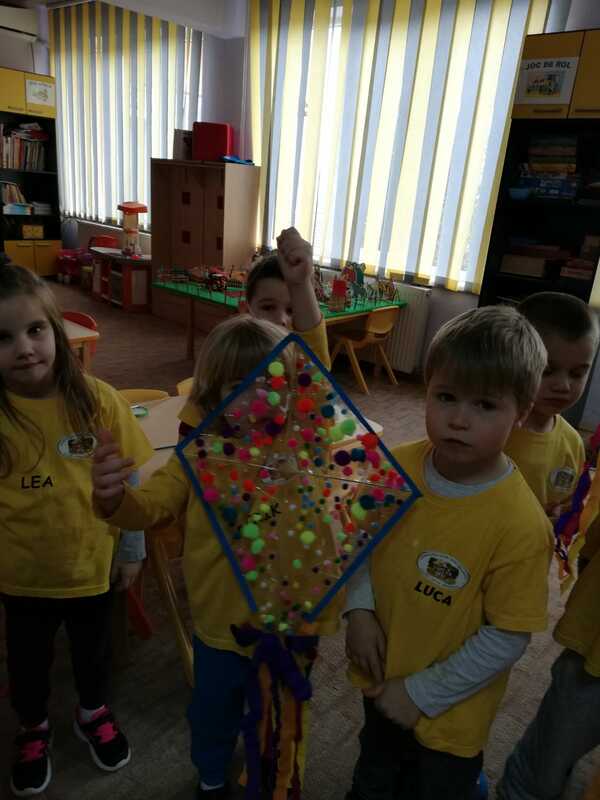 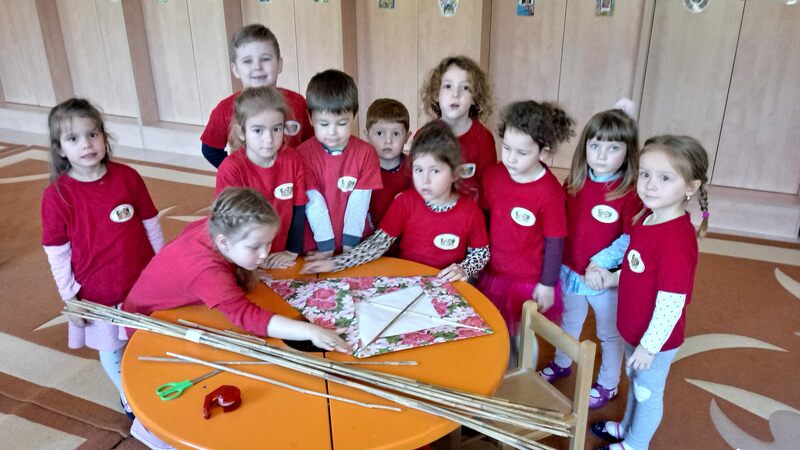 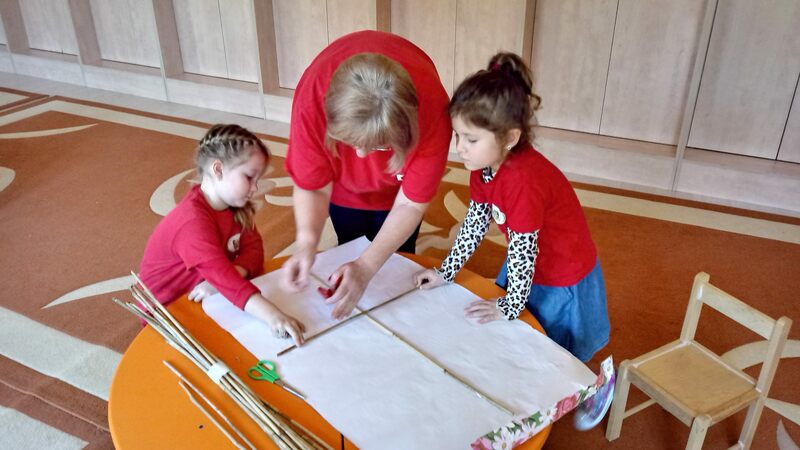 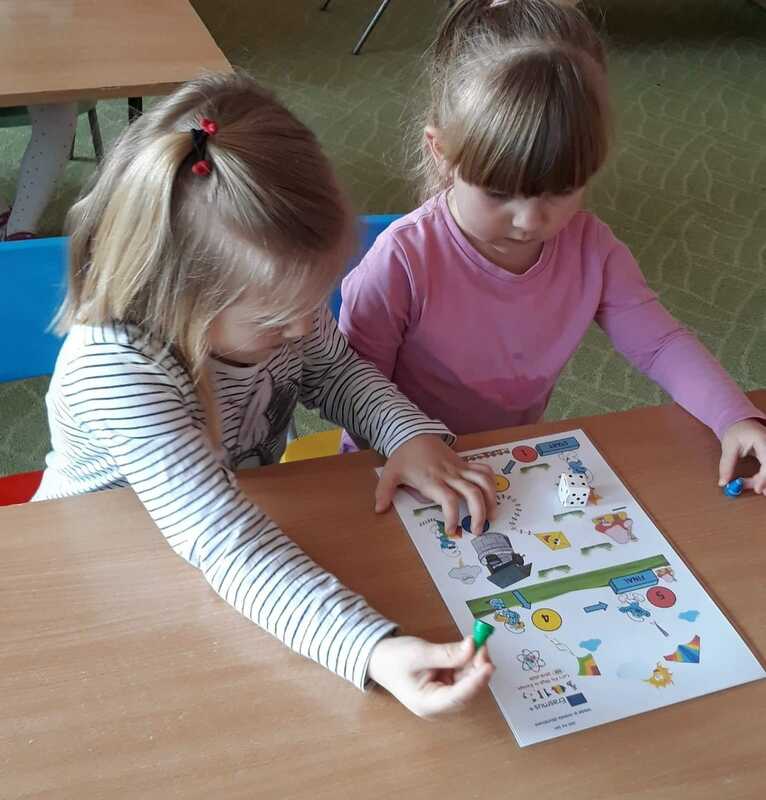 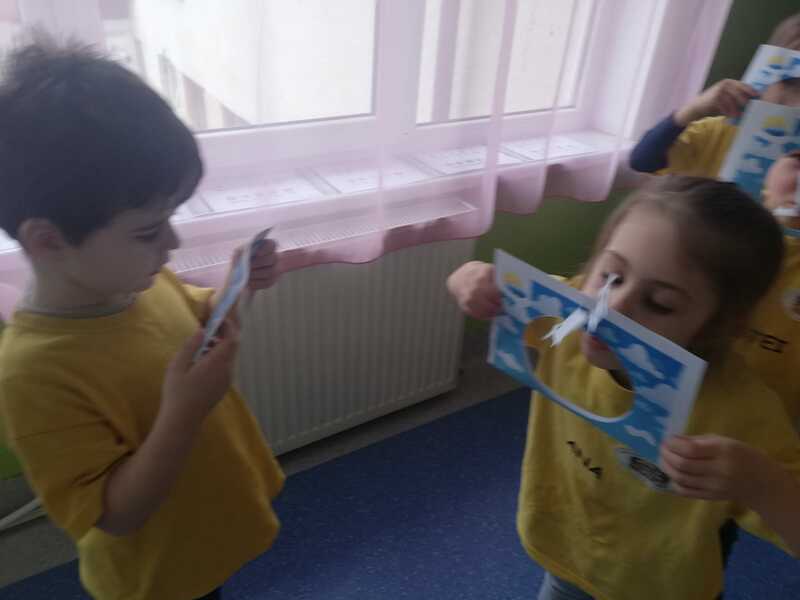 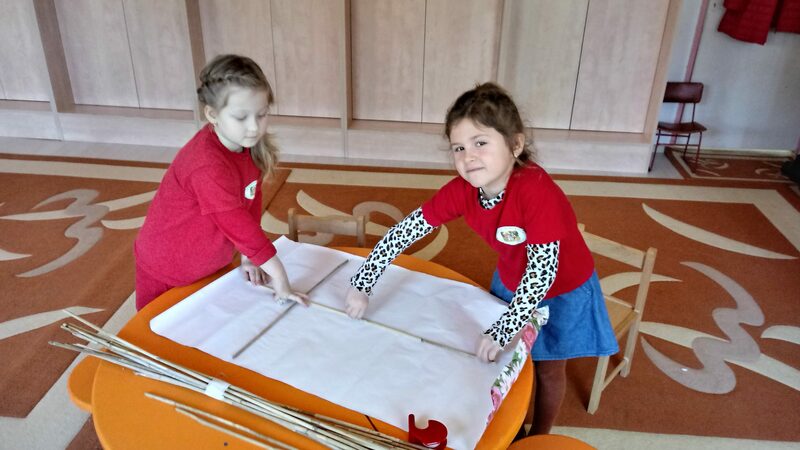 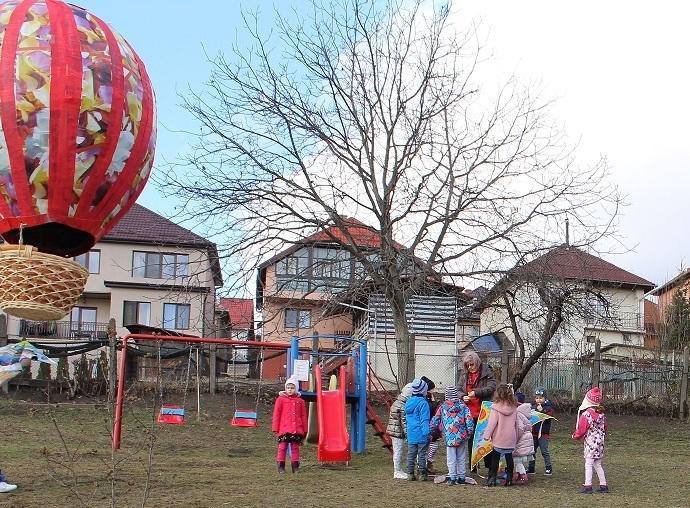 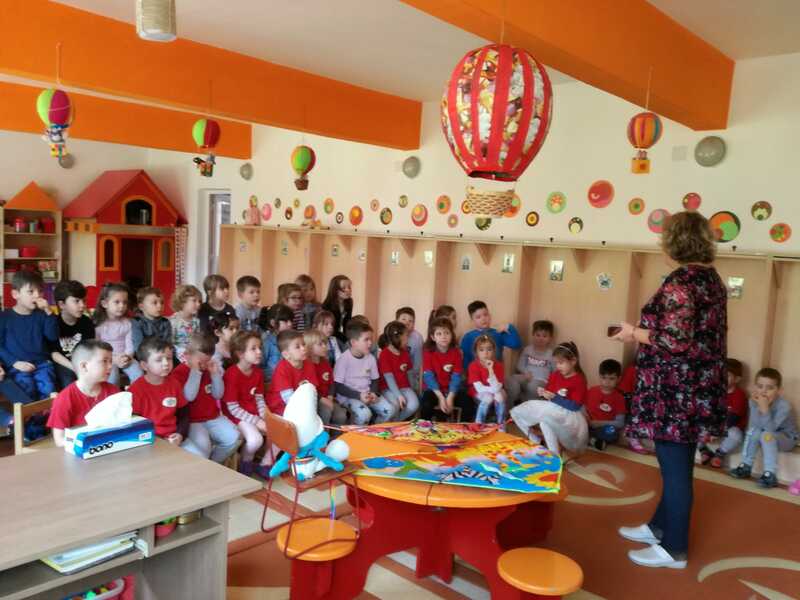 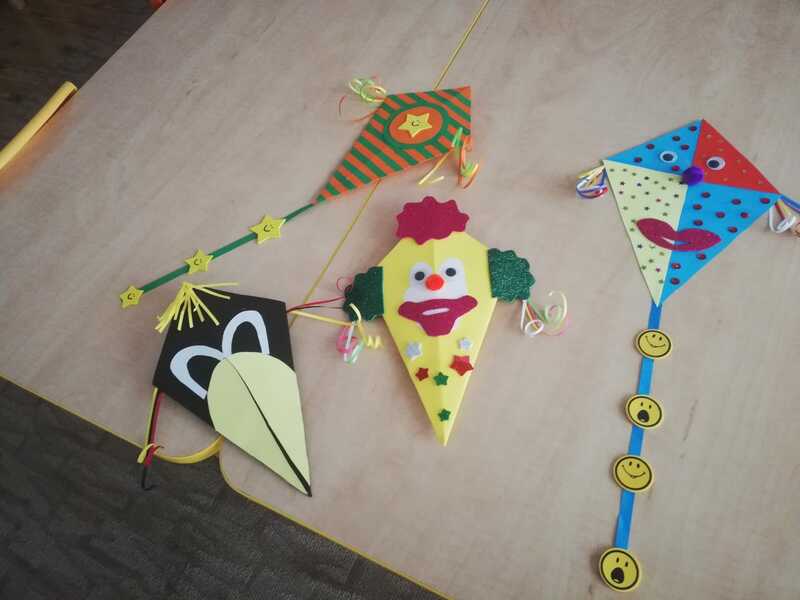 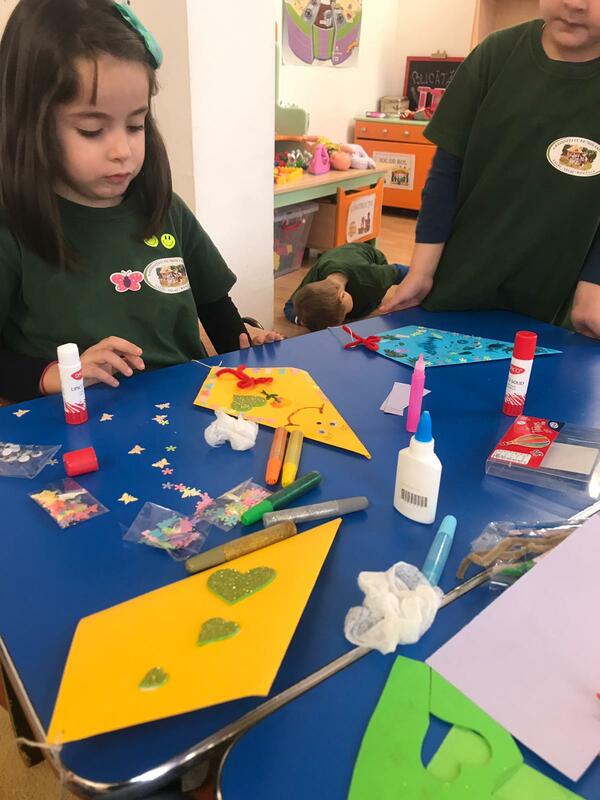 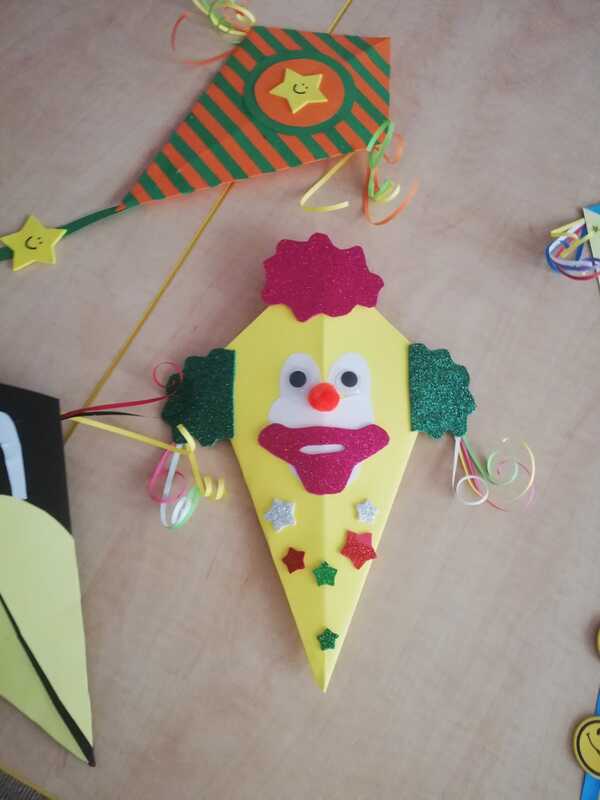 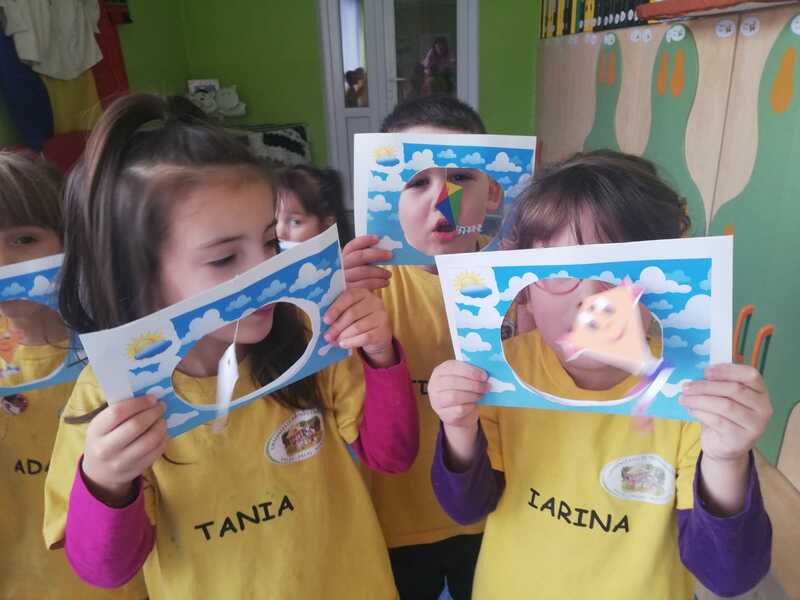 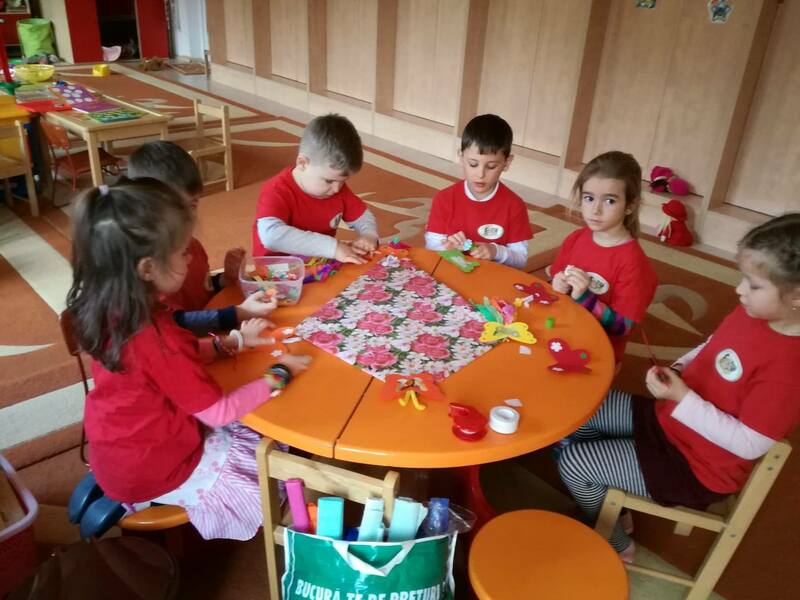 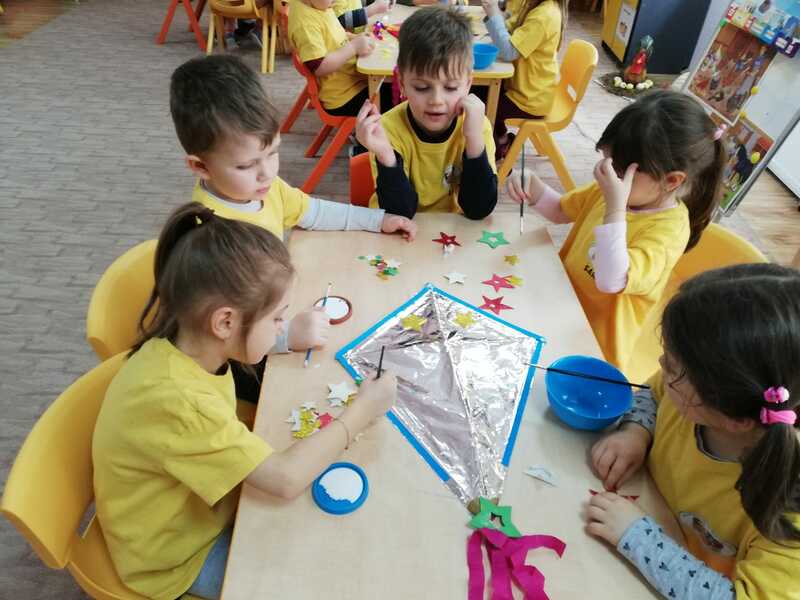 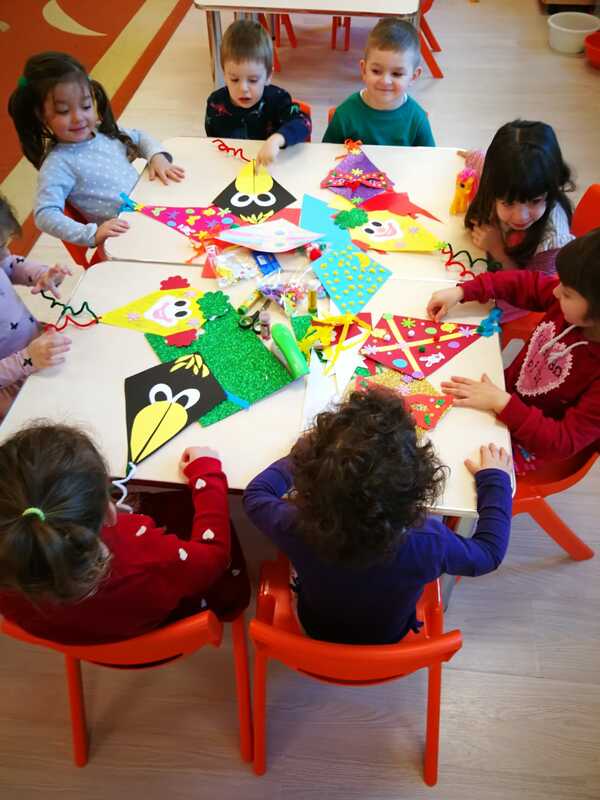 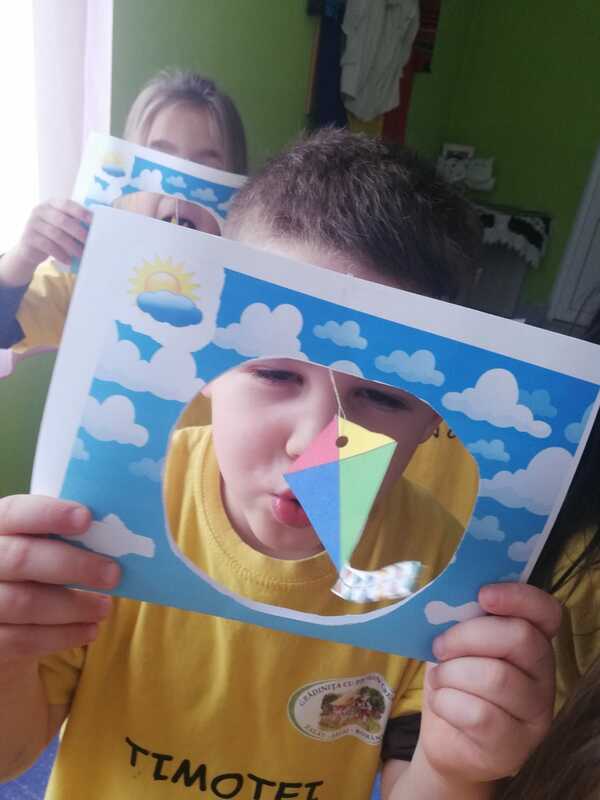 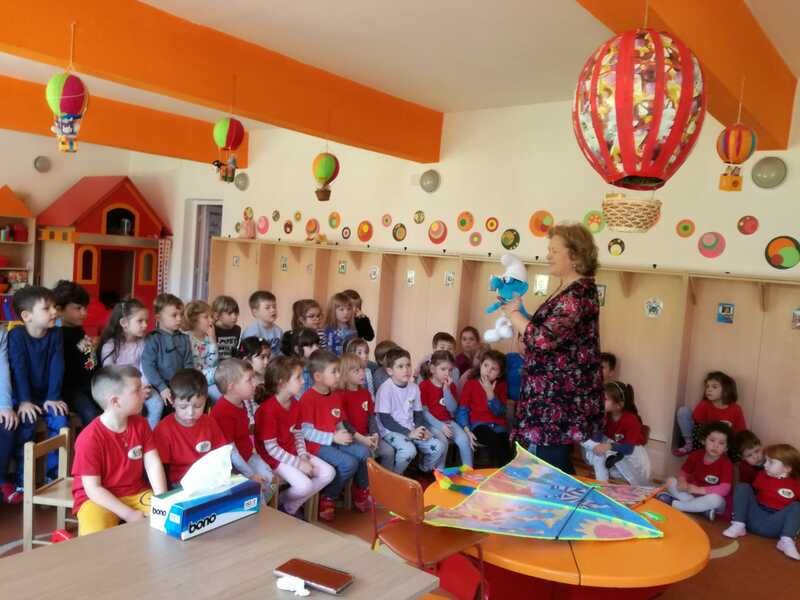 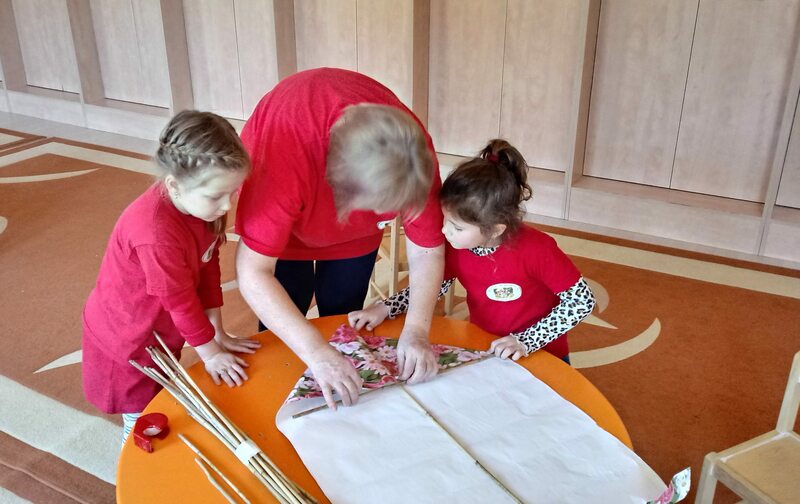 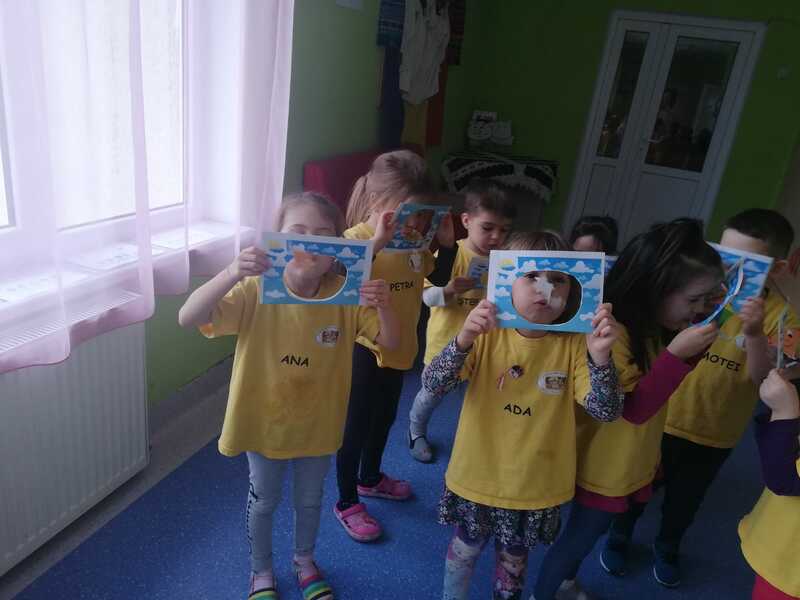 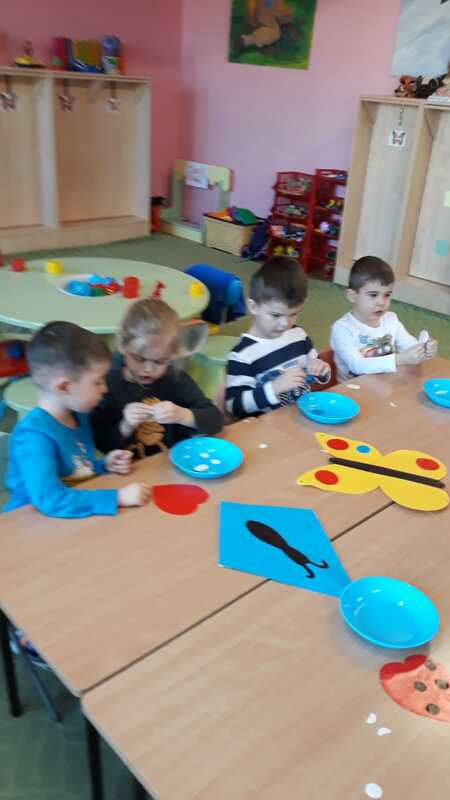 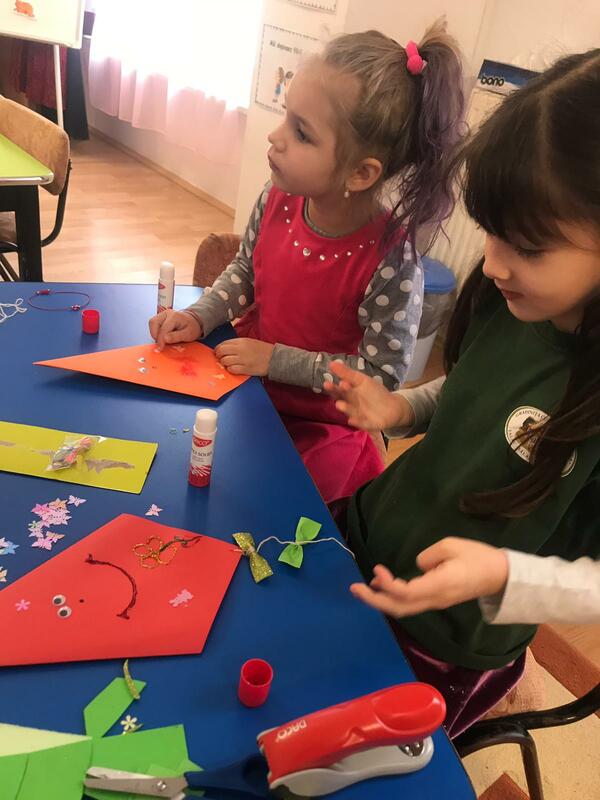 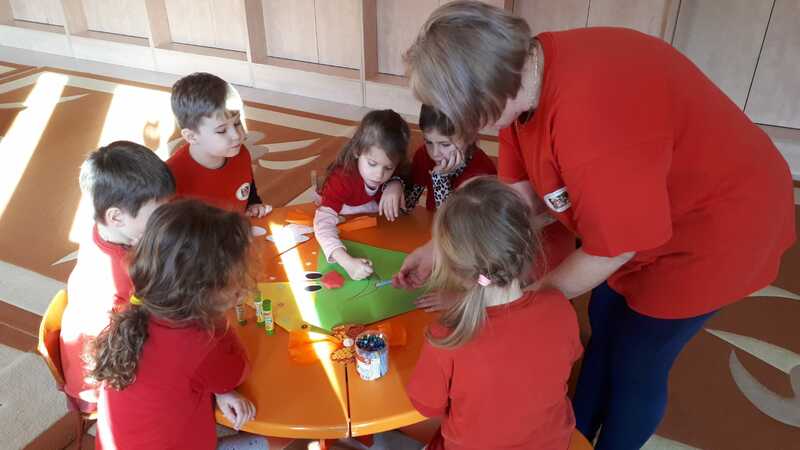 During the activity, children will recognize the numbers on kites (1-4) and learn the word “VESEL” in all partner languages: “happy” -English, “allegro” – Italian, “jayeux” – French. 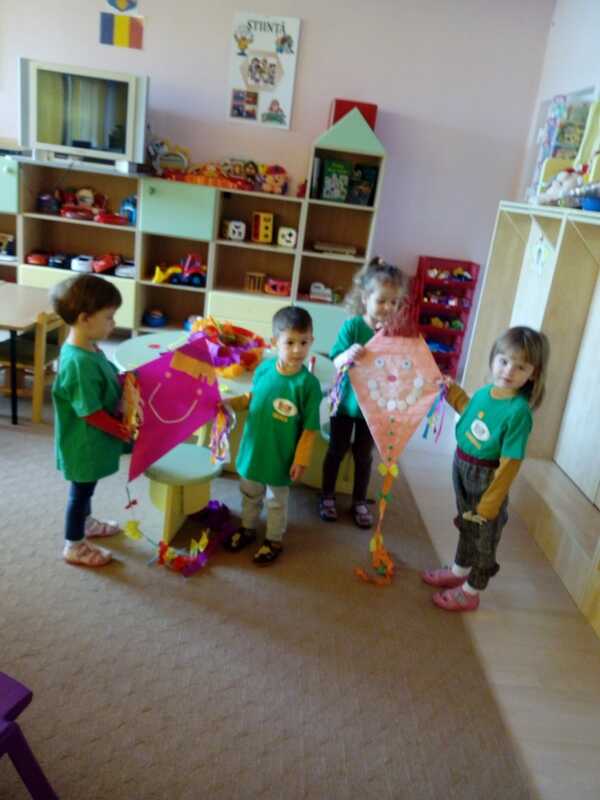 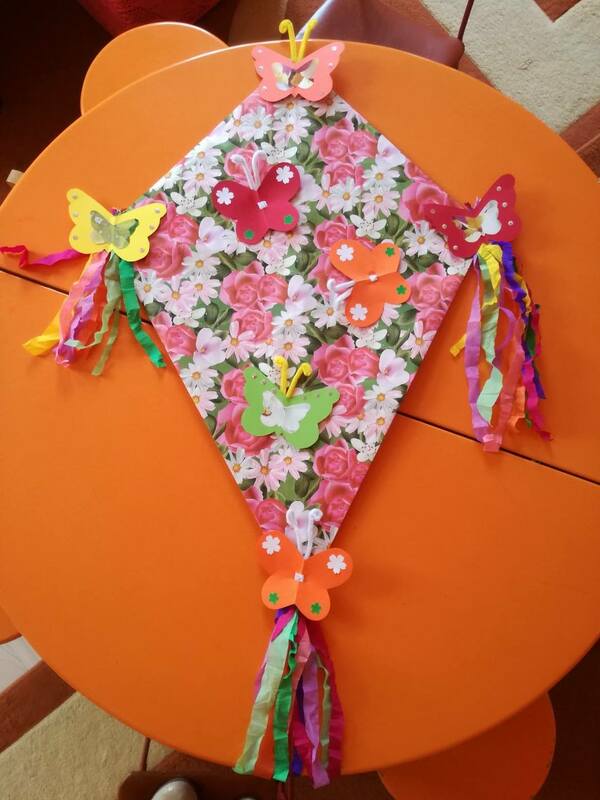 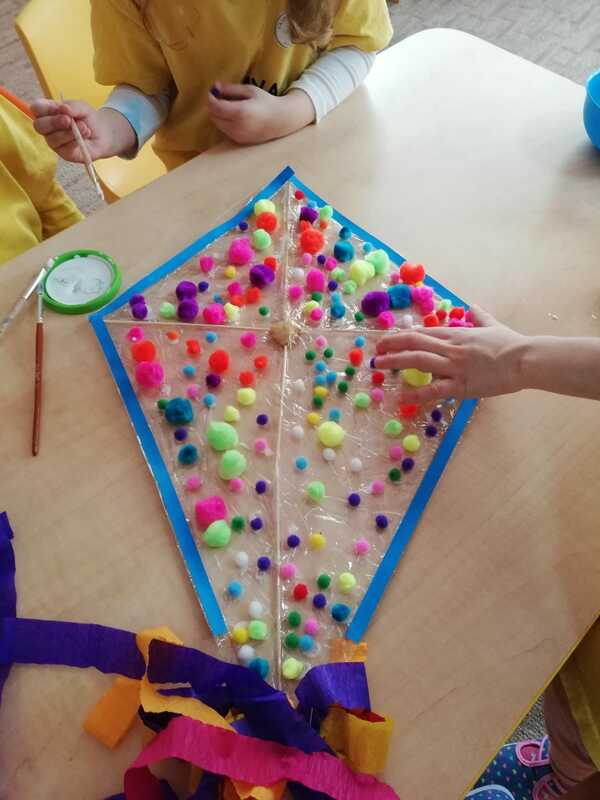 At the end of the activity children will participate with joy and enthusiasm to ascension kites.